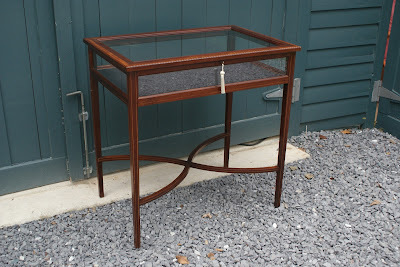 I have developed a bit of a backlog of photos of completed work over the past couple of months. 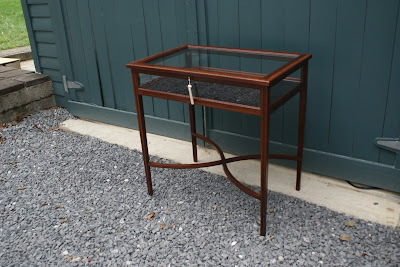 In an effort to catch up I am showcasing some of the more interesting pieces that have come through the shop recently. Below I will describe the pieces and the work we did to them. This was one of my favorite chairs to ever come through the shop. It is a Lath Back Windsor made from various woods including beech and elm. It was made sometime in the middle of the 19th century. 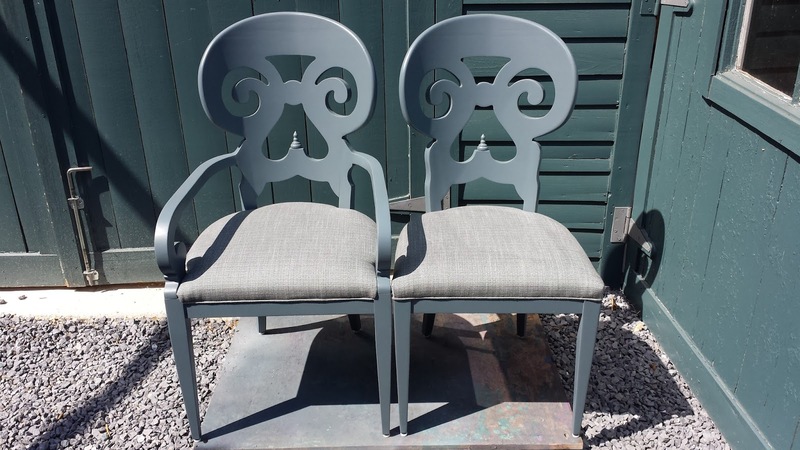 These chairs are great, they have great form and are very comfortable. This one had loosened up so I glued the loose joinery. 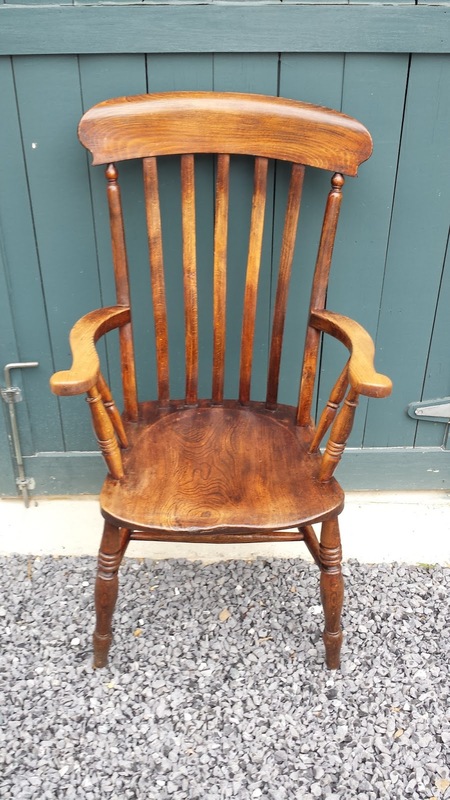 The wear on the chair was wonderful, especially on the arms, so we simply cleaned and waxed the finish. These chairs are pretty run of the mill, and were probably made around 50 years ago. I chose these to showcase the great job my caner did on the rush seats! 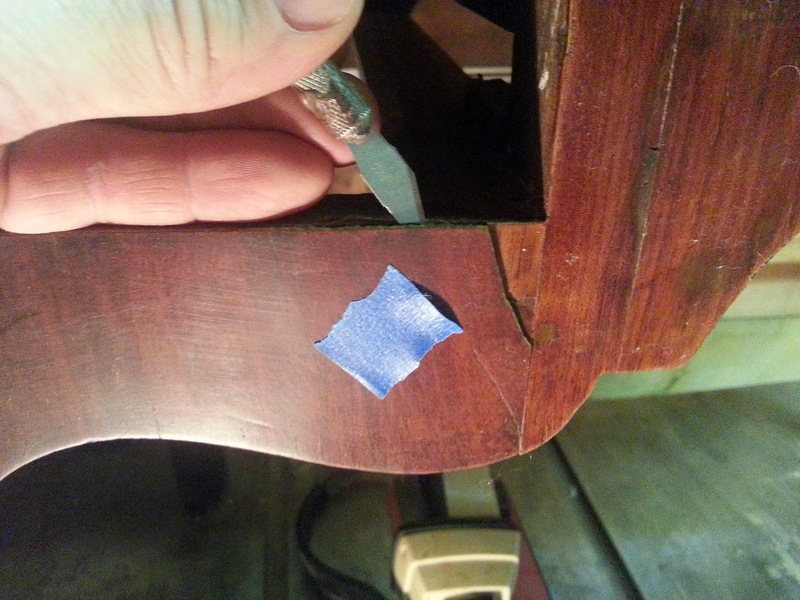 Beyond the seats, I glued the loose joinery, and cleaned and waxed the finish. 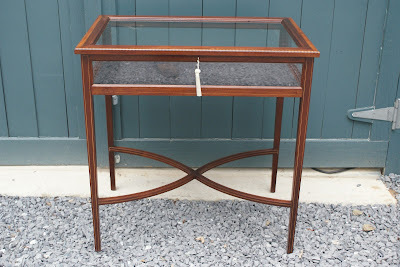 I have written about draw leaf table before on this blog. All of the examples that come through the shop seem to be from the early part of the 20th century. This one was made form European walnut and beech. 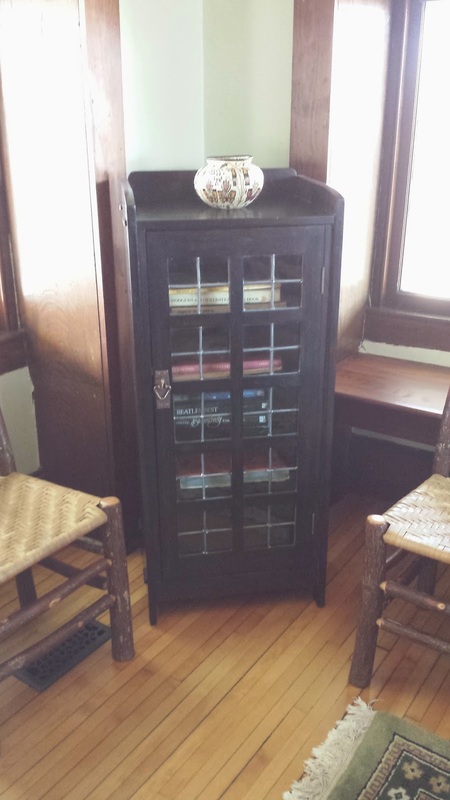 It had a French country style, and was probably made in France or possibly another country on the European continent. 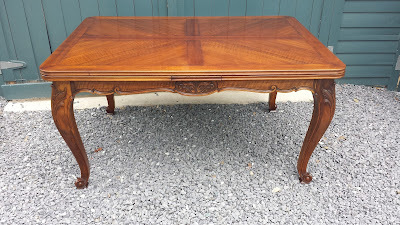 This table was in pretty rough shape, so we removed the finish and refinished it with a French Polish finish. This table came from Switzerland and was made from old boards of European walnut. That being said, it was made fairly recently. 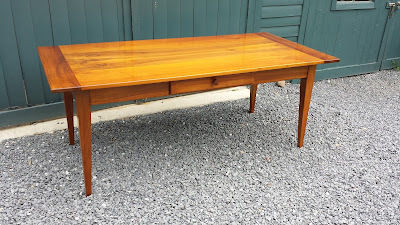 I liked this table a lot because it reminded me of the first dining table I made, which was also of walnut. 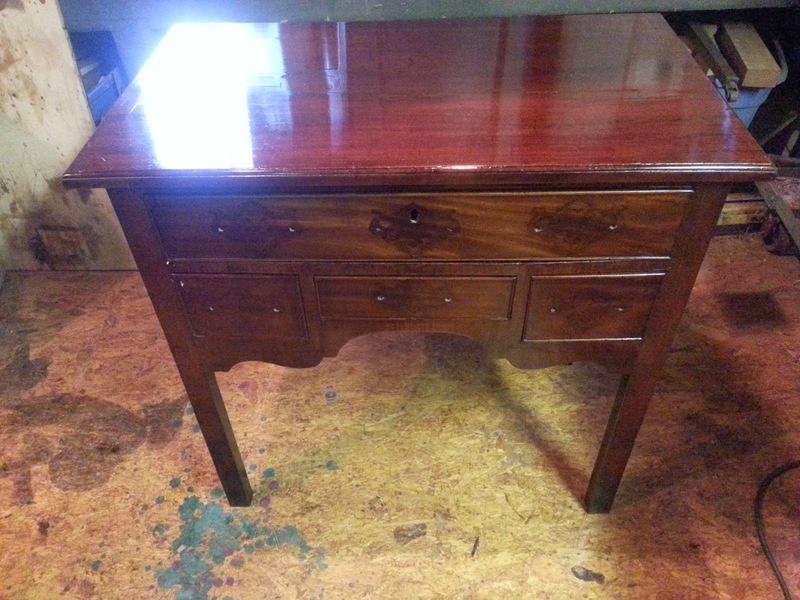 The finish was in bad shape, so we refinished this with a French Polish finish. 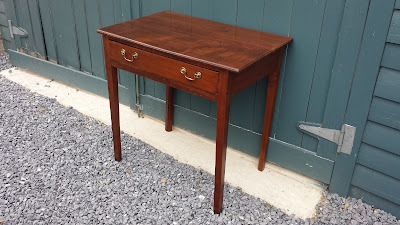 This was a sweet little table, made from European cherry in the early part of the 19th century. 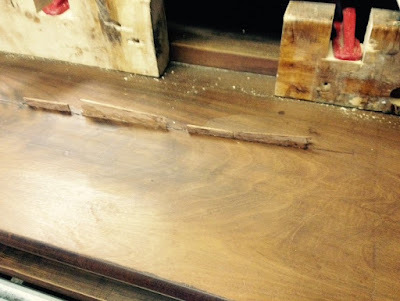 Despite the cabinetmakers attempts to use good straight grained wood, the back legs had warped severely! Because it was stable and there is no real way to fix this, I left them as is. 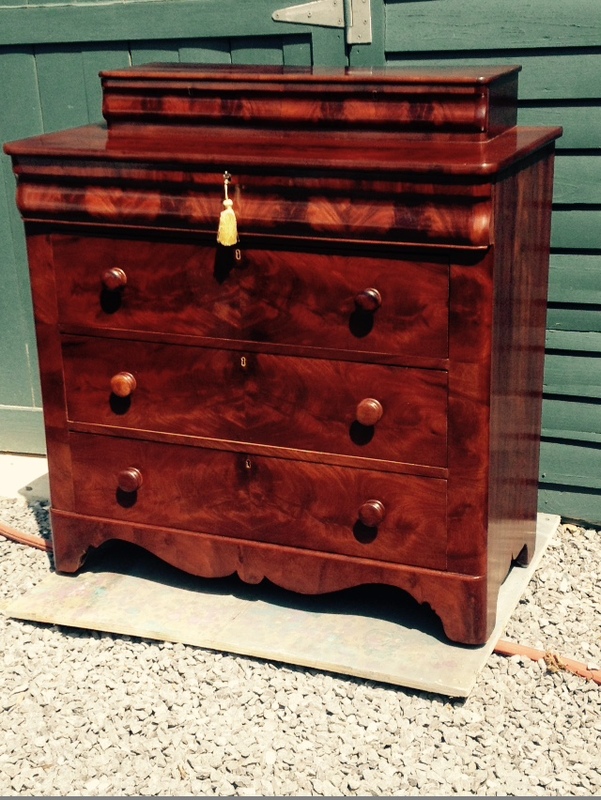 This piece was refinished with a French Polish finish. This table had some beautiful walnut veneer, as seen in the photo below. It was made in the 1930s and I refinished it with a French Polish and found a new walnut knob for the drawer. This chest was a lovely reproduction of a chest made by John Shaw (1745- 1829), a cabinet maker from Annapolis, Maryland. 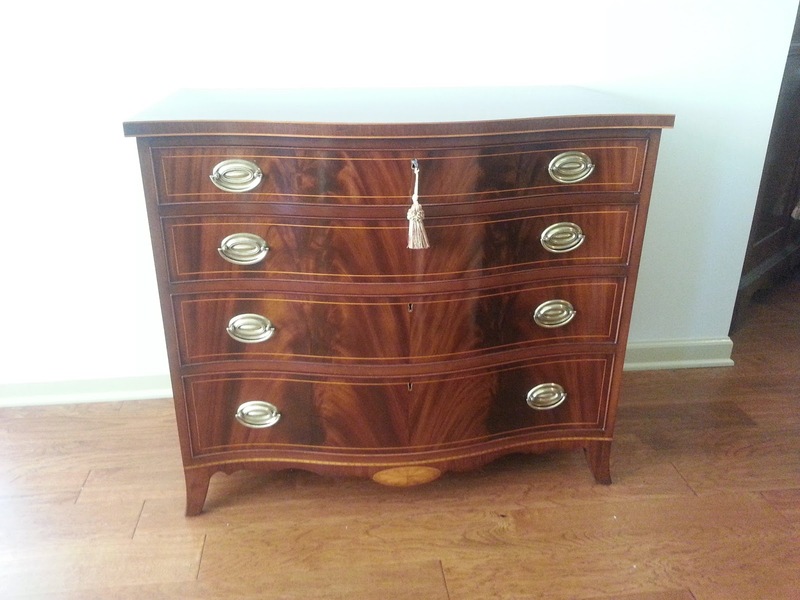 The reproduction was made by Biggs Furniture of Richmond, Virginia. 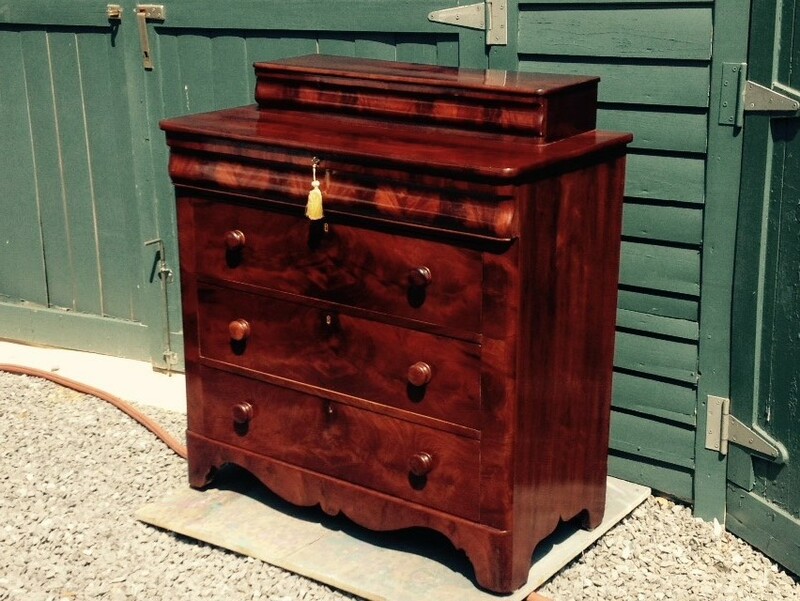 The chest, like the original, had beautiful crotch mahogany on the drawer fronts. 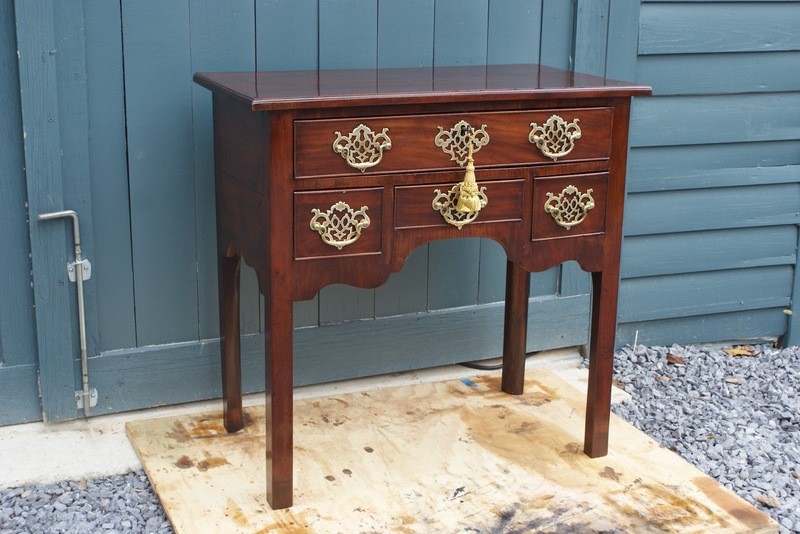 Quite a lovely piece, reproduction or not! This stand had a lot of work put into it. The top was edged with inlayed banding, some of which was missing and we had to recreate. 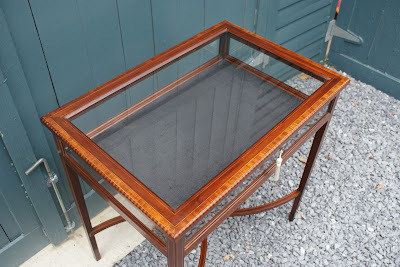 We also glued the loose joinery, replaced some of the glass, covered the bottom with felt, and refinished the entire case. I am sure I have more photos like these so I will probably be putting together another post soon of pieces that were recently restored. 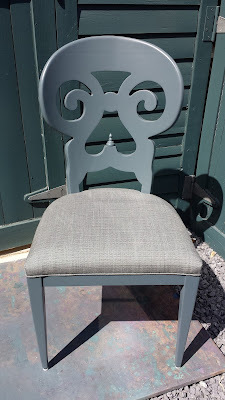 One of the things we have started doing this year on occasion is to paint furniture for customers. We were hired earlier this year to paint a set of eight chairs and reupholster them as well. 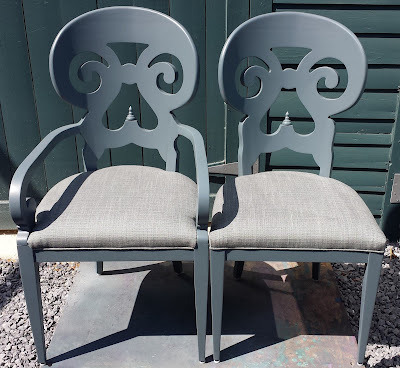 The chairs were around 25 years old and the customer loved them, but wanted a color change. 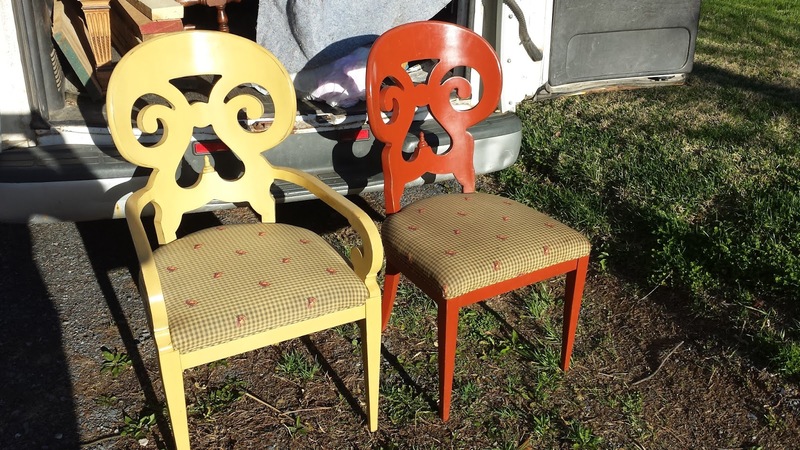 Below is a photo of two of the eight (originally they were painted yellow, red, and eggplant). 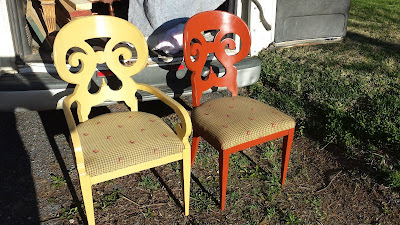 The rest of the photos show the painted chairs with the new upholstery. 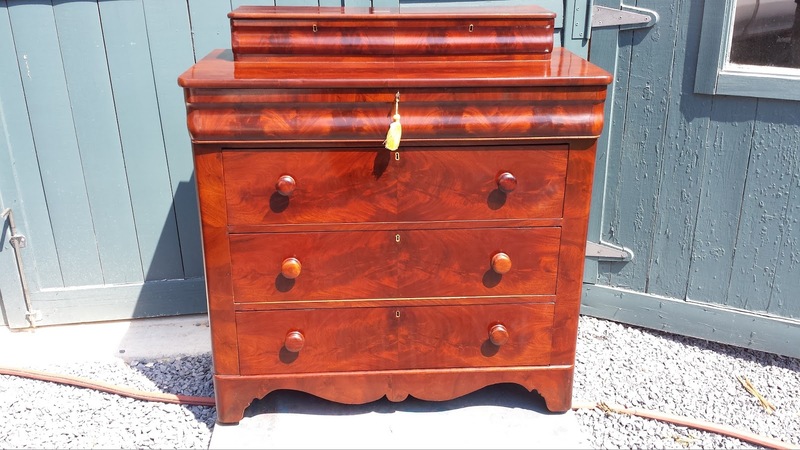 I have written a fair amount about American Empire period furniture on this blog. 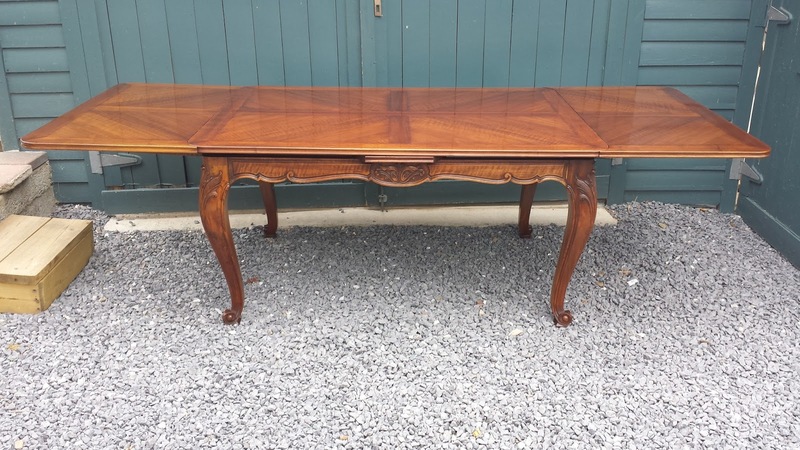 This furniture was produced from around 1830 to around 1860. The use of thin veneers of crotch mahogany over a substrate of a cheaper domestic wood, in this case pine, allowed for an inexpensive means of mass produced furniture with fantastic results. 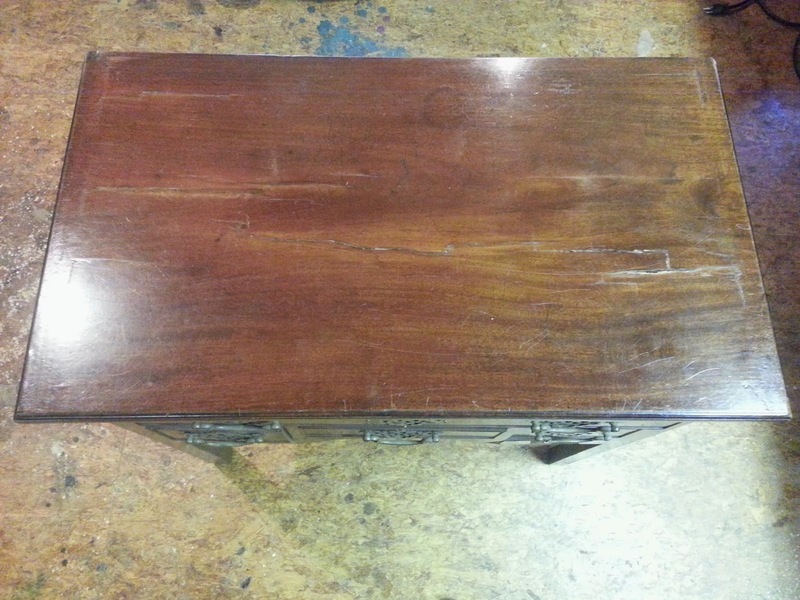 In the case of this chest, every surface was veneered, including the sides and top. 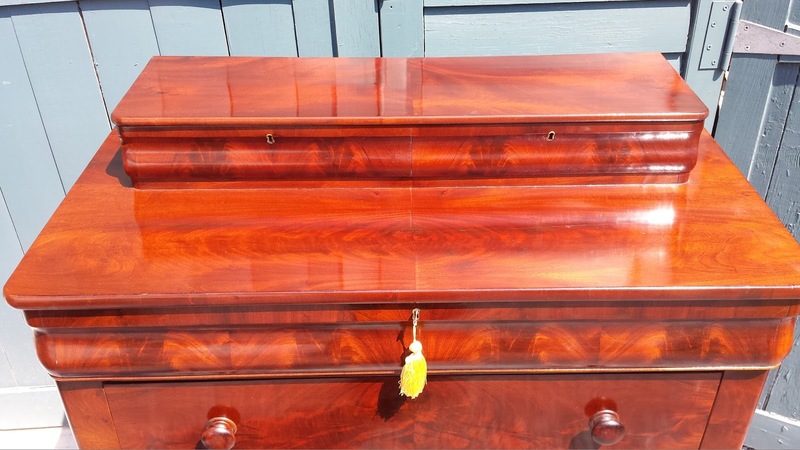 Where it mattered most, like the top and drawer fronts, sequenced pieces of fancy crotch veneer were used in a bookmatched pattern to display the dramatic grain of mahogany. This piece was made using a mixture of machinery, like circular saws, and hand work, like hand cut dovetails. To me, one of the most interesting aspects of this period is seeing the introduction of mass production techniques and what the craftsmen could accomplish with the use of machines and what was still necessary to do by hand. 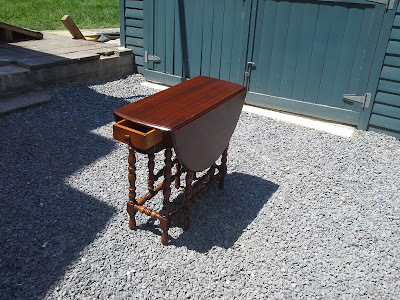 As the 19th century progressed, more of these procedures were accomplished with the use of machines, culminating in the machine made dovetail (ca. 1900). During the American Empire period, most of the work was still done by hand. The chest was in pretty rough shape. 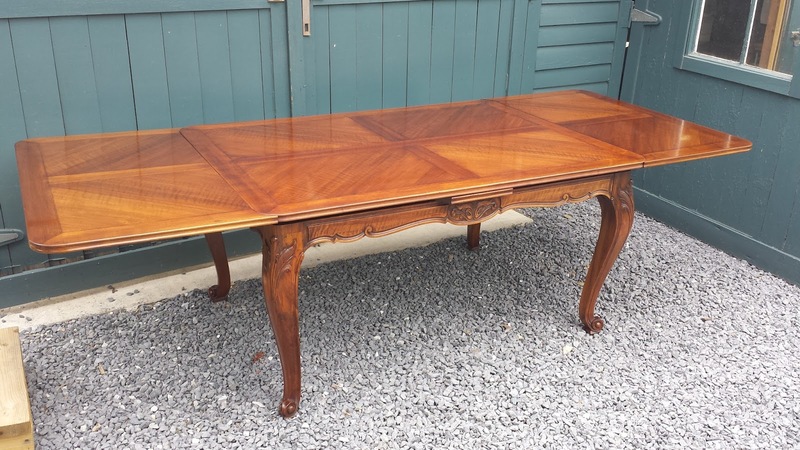 The finish had darkened and deteriorated to the point that it became necessary to remove the finish and put a new French Polish on it. 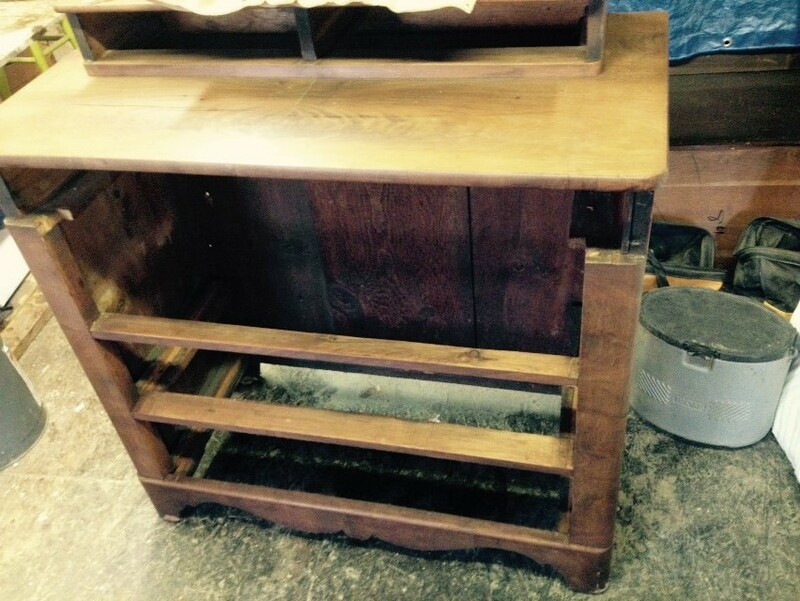 The case and drawers also needed work, both on structural and cosmetic levels. 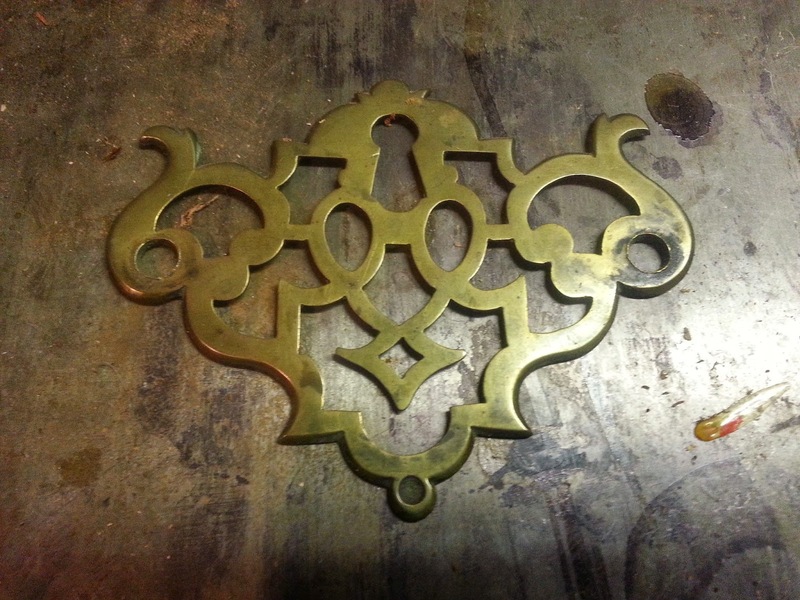 Below are a few photos of the piece with the finish removed. 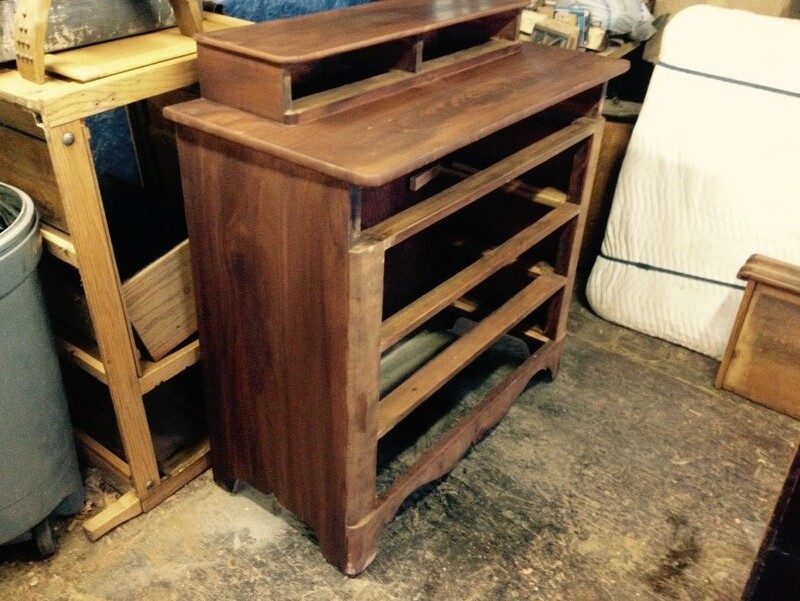 In this photo, you can see the second long drawer down is in askew. 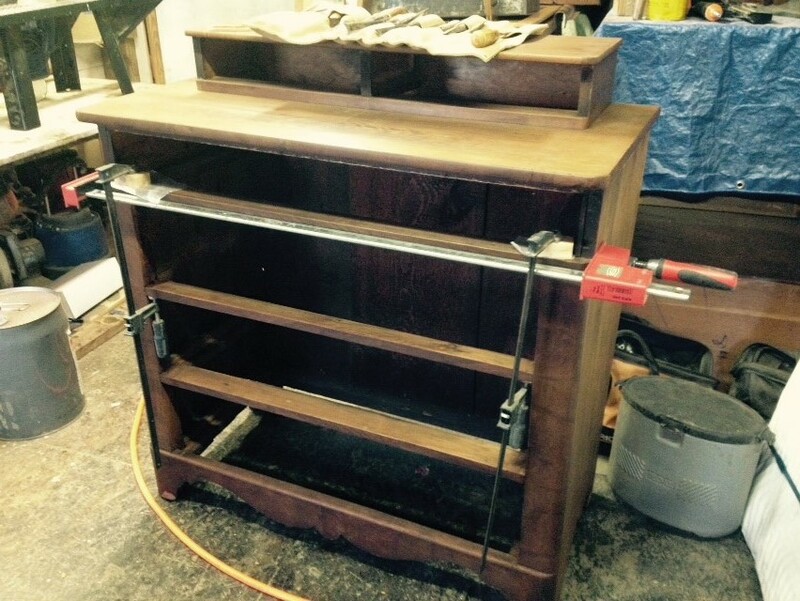 This is due to the missing interior runners that would work as guides and support for the drawer. Also note the missing escutcheons on the two center long drawers. 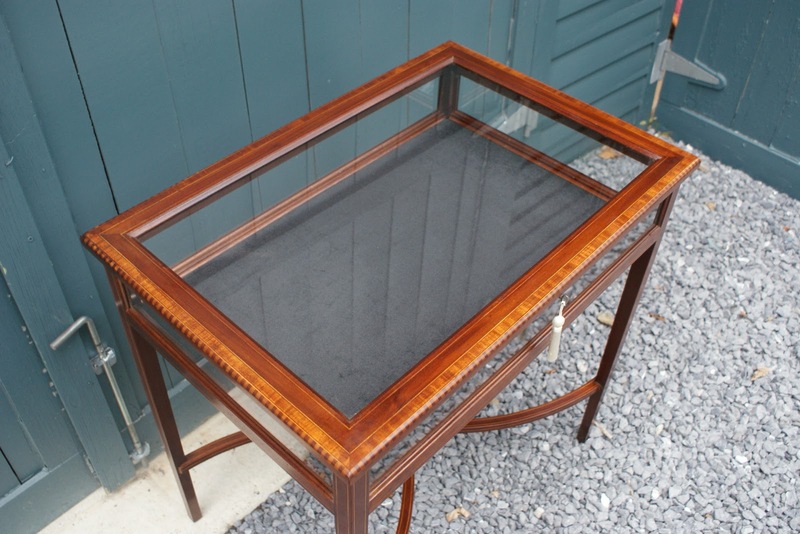 The case sides, veneered with straight grain mahogany, were also cracked. 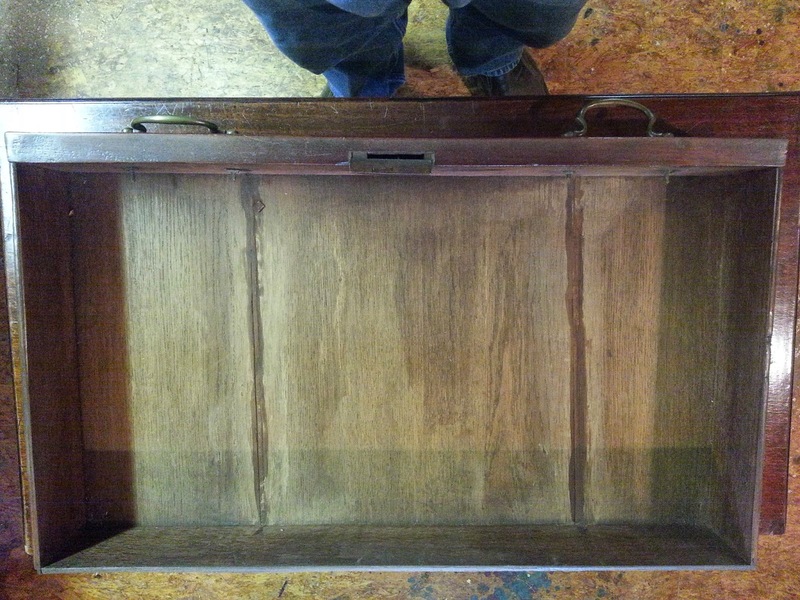 This photo shows the stretcher between the ogee drawer and the lower long drawer removed. The glue had failed and re-gluing this tightened up the case quite a bit. The following photo shows the stretcher being glued. 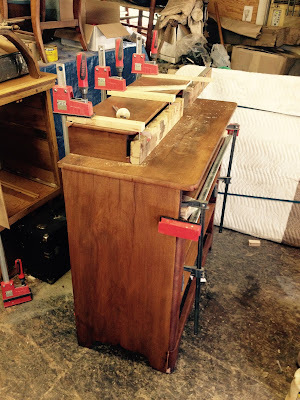 These next two photos show the top of the glove drawers being glued and straightened. 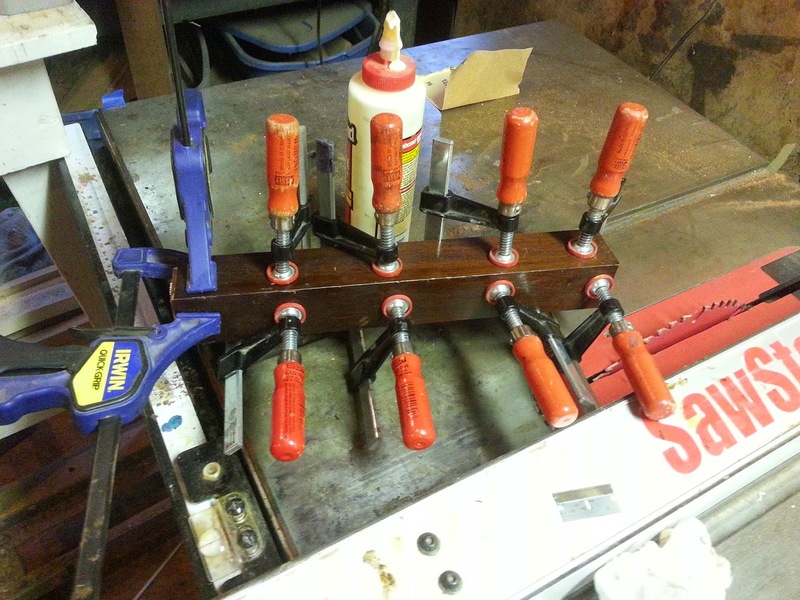 Jesse, who did this repair, came up with some clever clamping! 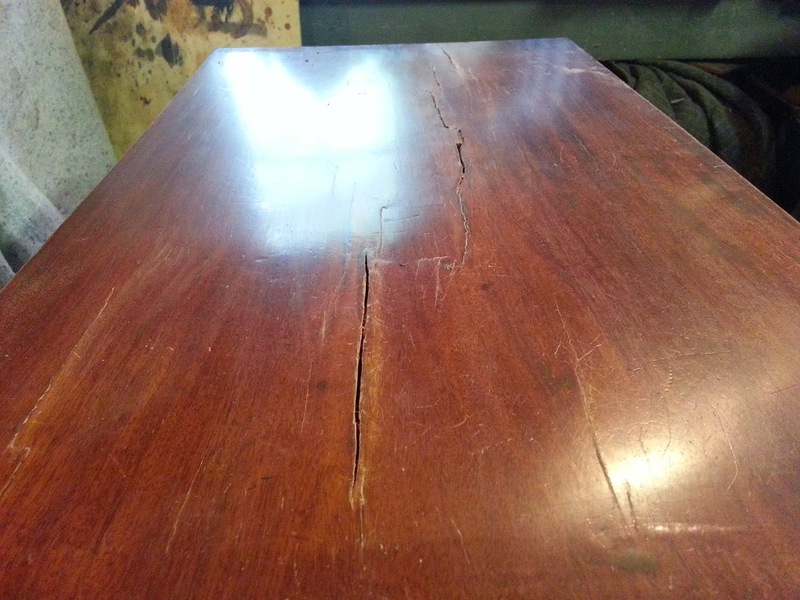 The crack in the top (seen in the next photo) was patched by means of wedges that were inserted and then, once the glue was dried, carved down flush with the surface of the top. The entire repair was later touched up. The existing interior runners were significantly worn, so they were removed. 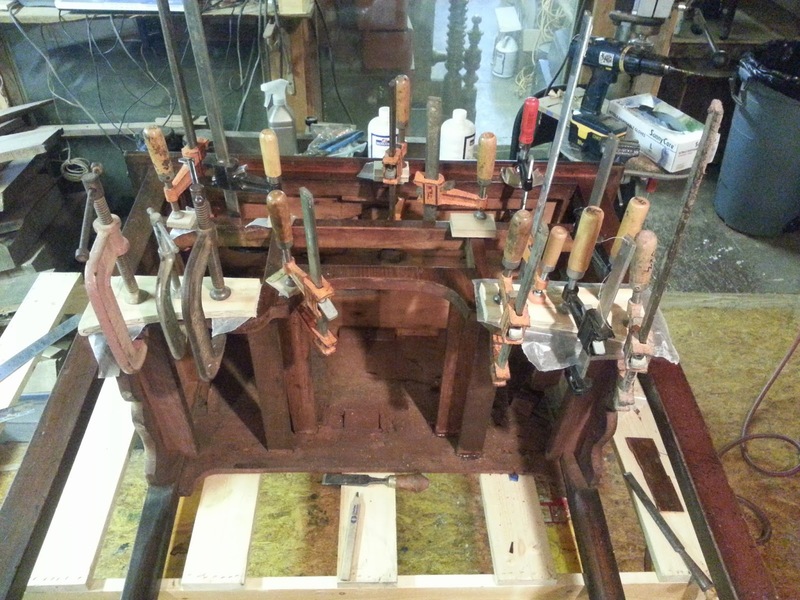 The wear flattened with a hand plane (as seen in the next photo) and the runners were put back in place. 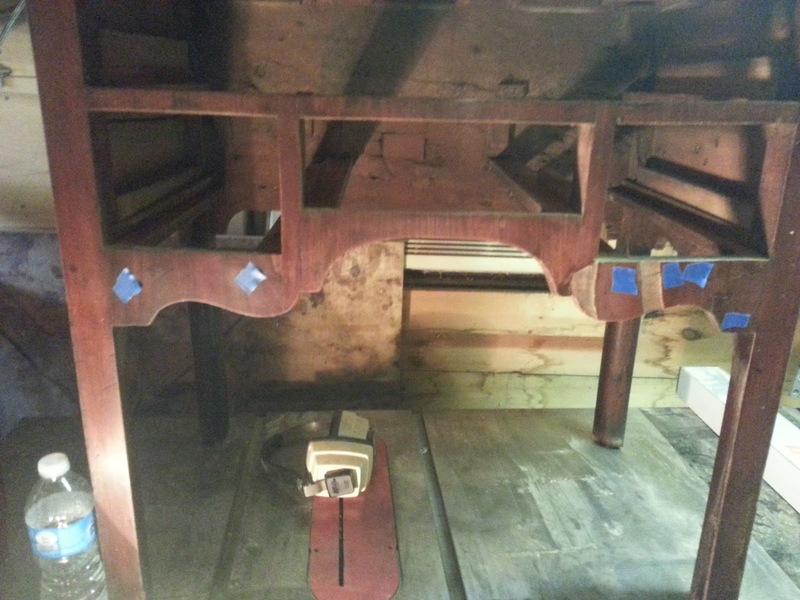 The missing interior runners mentioned above were made using old pine stock and fit to the case. 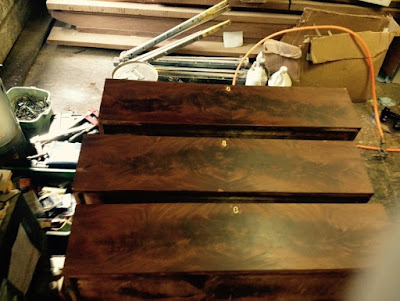 These next two photos show the drawers in case while finish was being applied. 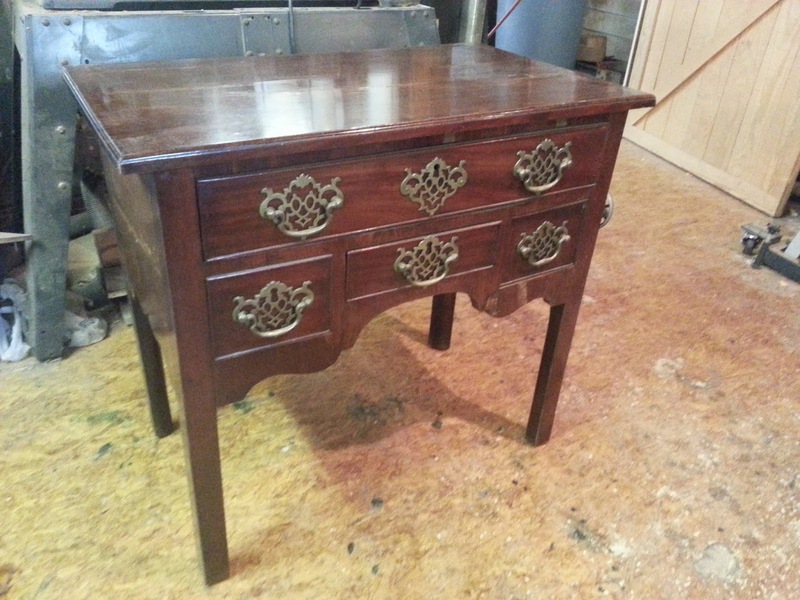 Note the brass escutcheons in the drawers. Two were missing and replaced. The remaining photos show the completed chest. Jesse took some interesting photos of the case with a filter on, making the piece appear darker. 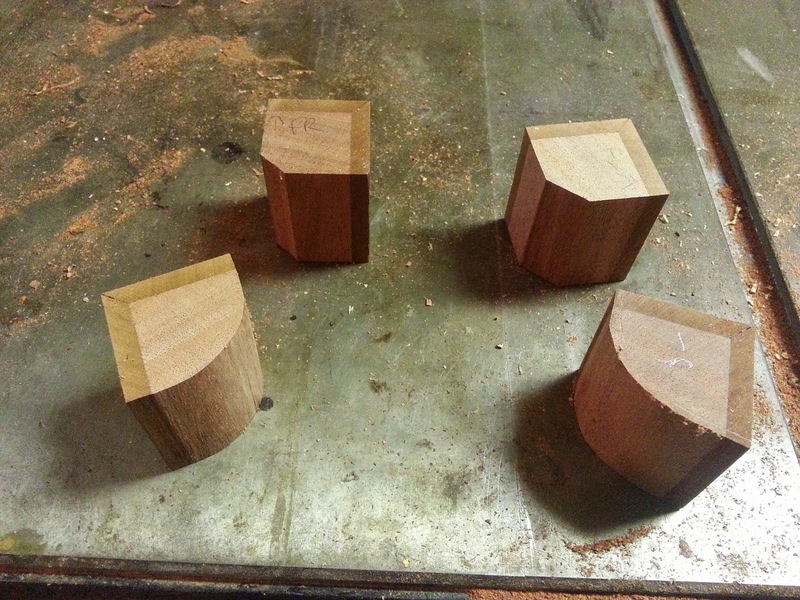 I included these because they show the dramatic grain of the crotch mahogany. I'm also including a link to another blog by Robert Lang about my original post. Bob's original article on the construction of the cabinet for Popular Woodworking was a great help to me when it came time to build this cabinet. It was a great complement to read his review of my work. 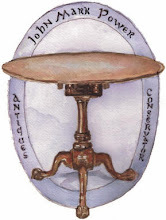 If you have the interest and time, Bob's website is a treasure trove of information about Arts and Crafts furniture and its construction. Deja Vu all over again! 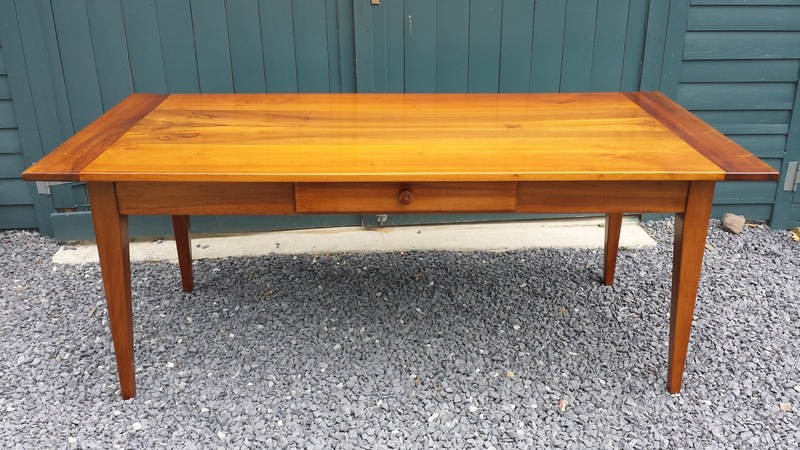 One of the interesting side effects of writing this blog is that several of my posts have been read by people with a similar or, in this case, the exact piece of furniture. These customers then contact me, often with questions, or in some cases, to restore one just like the one that I did for another customer. 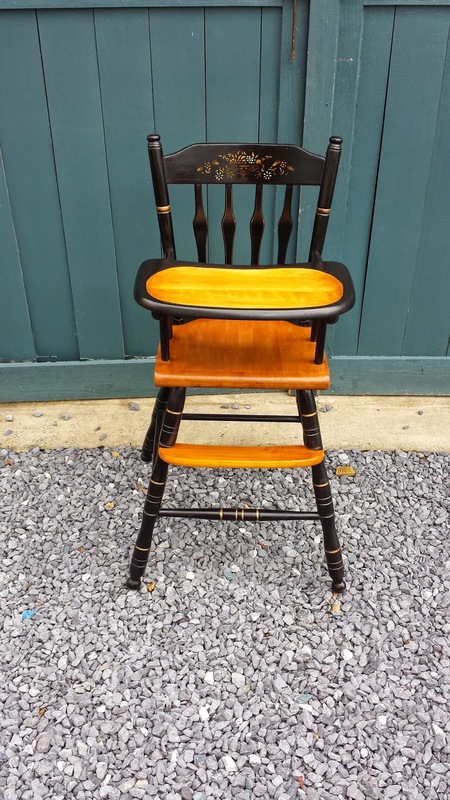 One of these reoccurring themes in my work was a high chair made in the style of furniture made by Lambert Hitchcock. 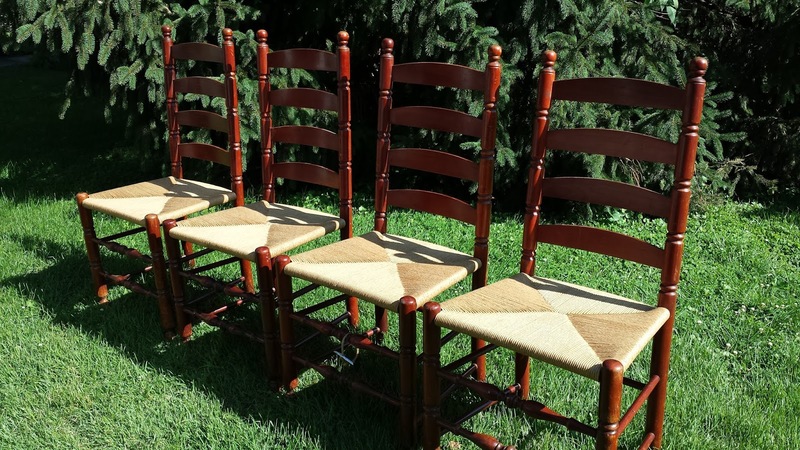 These "Hitchcock High Chairs" were made in the 20th century (I am guessing around 1970). 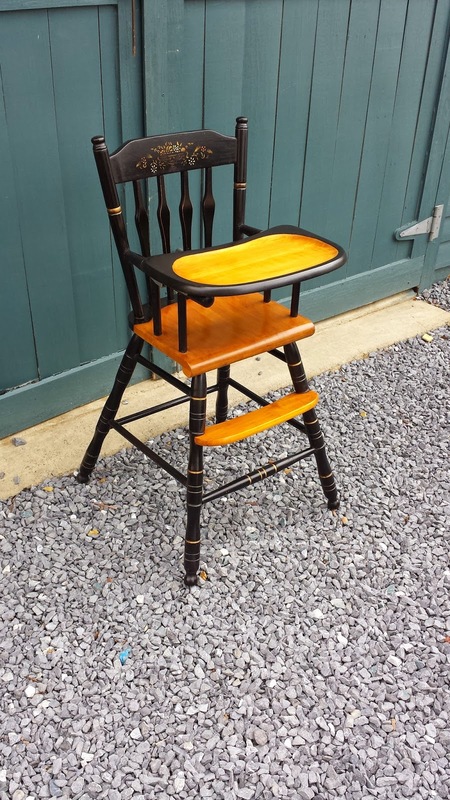 All of the examples I have worked on are maple with black paint on the majority of the chair. The crest rail is stenciled in the manner of Hitchcock chairs of the 19th century. I have yet to work on a white painted version, but they do exist. 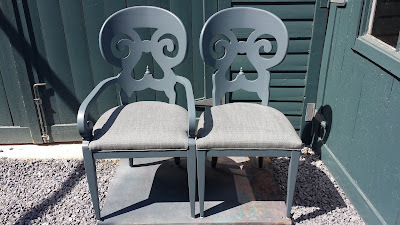 I do not know if it was the 1970's incarnation of the Hitchcock Chair Company that made these chairs or if they were made by another company. I do know that in most cases, I can restore them and people from far and wide are contacting me to do so. 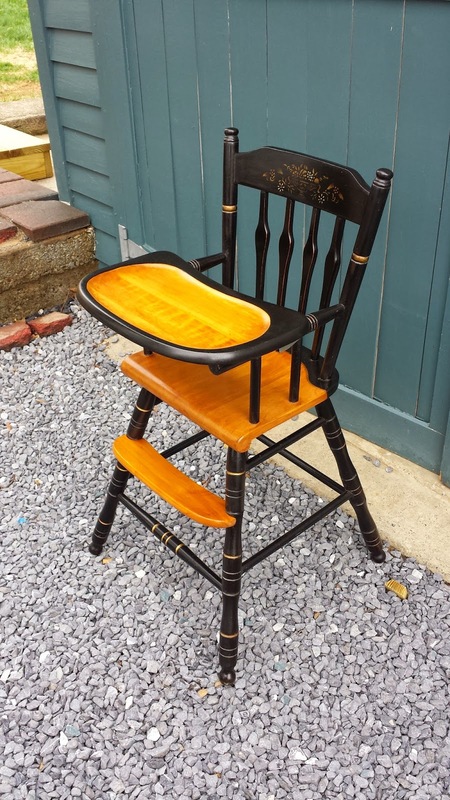 So without further adieu, I bring you the third Hitchcock high chair to grace my shop. 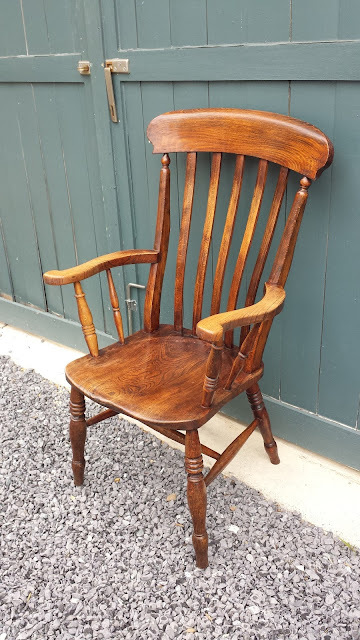 I only got one photo of the chair as it came into the shop, and it was only a photo of the seat. The finish had peeled off of the unpainted portion of the seat and tray. The process of restoration can be read in the links below to my earlier posts. The only thing we did differently was to finish the natural portions without staining them, which looked quite nice! If anyone is looking for one of these chairs, I have one that I would love to sell. It needs a bit of work, but I can do that. Please feel free to email or call me at 703-727-5691 if you are interested! As a restorer of antique furniture, I see a lot of different pieces in my shop. 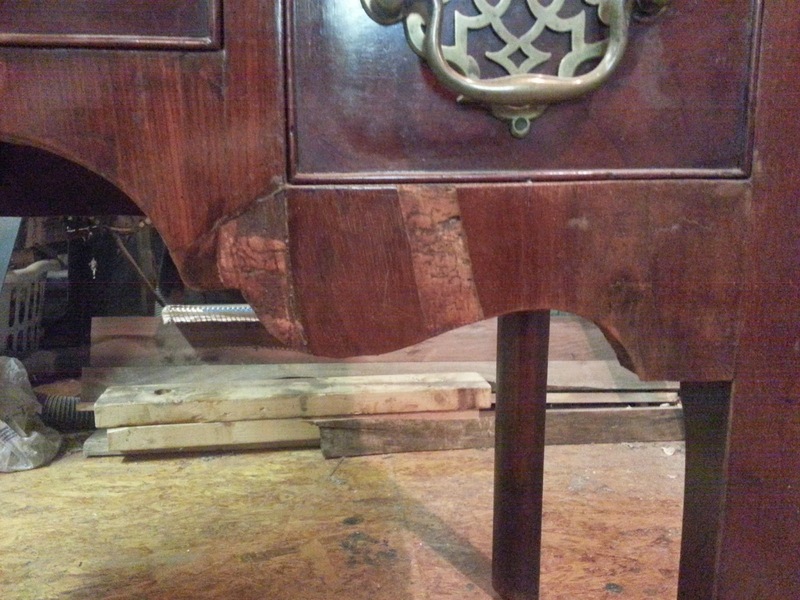 Each piece requires specific repairs and offers up new challenges. That being said, there is a usual process that I follow when I restore a piece that ensures that the piece will be restored completely and in an effective way. 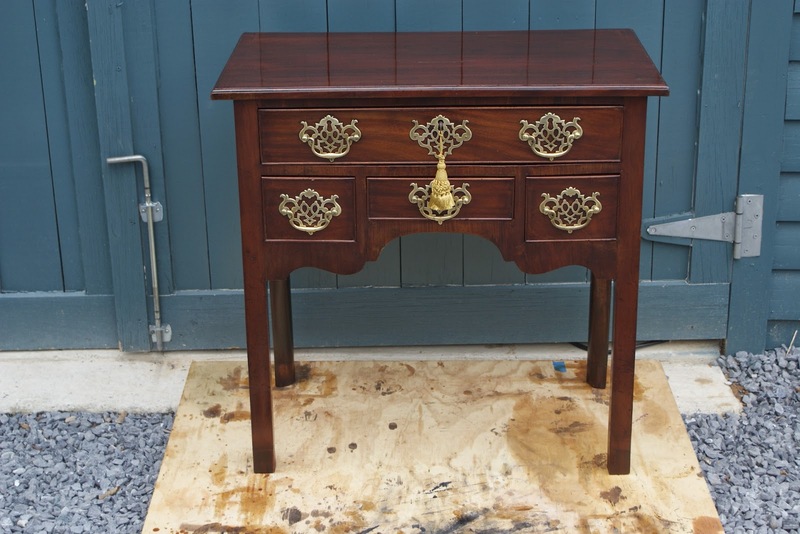 In the example of an 18th century English dressing table, I will describe the general process of restoring a piece and also some specific repairs made to this piece. A quick note on terminology. I use the word “restoration” to describe the process of my work. 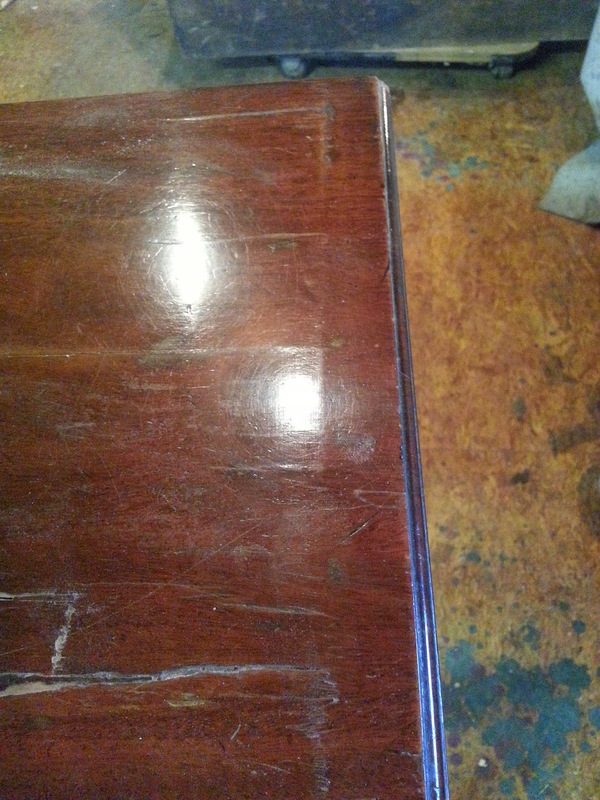 What I mean by this is the restoration of the original or existing finish. I do not use the word refinishing unless that is something that I am actually doing. Paired with restoration is conservation, which I describe as retaining and stabilizing as much of the original material of the piece as possible, and when repairs are made, I use materials consistent with the age and condition of the piece. I will explain this further as I go along, but basically my goal is to restore a piece to the condition of a well-cared-for antique, displaying the use and wear of the years it has been around. 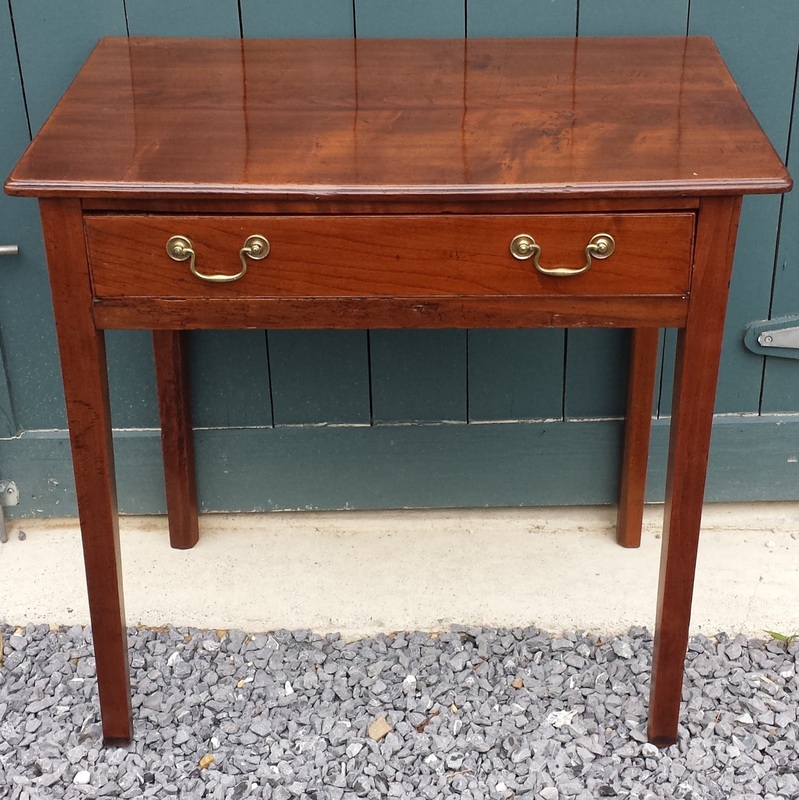 The dressing table I restored was made sometime in the second half of the 18th century, in England. The design elements of the piece as well as some of the construction choices point towards this time. Design and construction,as well as identification of the woods used on the secondary surfaces, also help to determine where the piece was made. 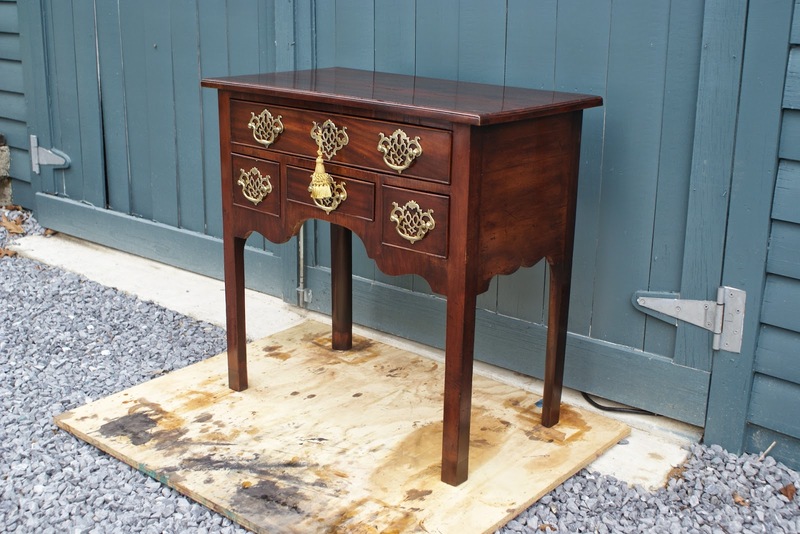 The dressing table form came into existence sometime during the second half of the 17th century in England and examples can be seen as early as the William and Mary and Queen Anne styles. In each case, The leg design was the drastic design change, first the trumpet-like turned legs of William and Mary, followed by the cabriole leg that has ,in part, come to define the Queen Anne style. 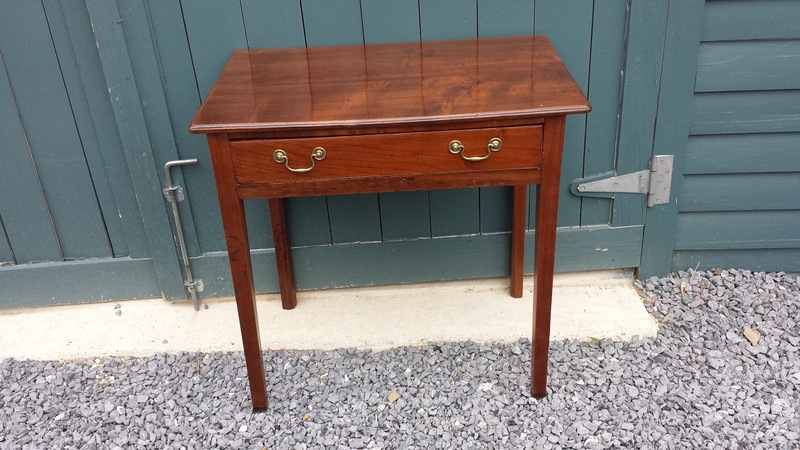 By the time this dressing table was built, the cabriole leg was being replaced by a straight leg that was chamfered on the inside corner. In some examples, a bead can be seen on the outer corners of the leg running from top to bottom.This straight leg was in keeping with design trends of the later 18th century, during the period usually described as George III. 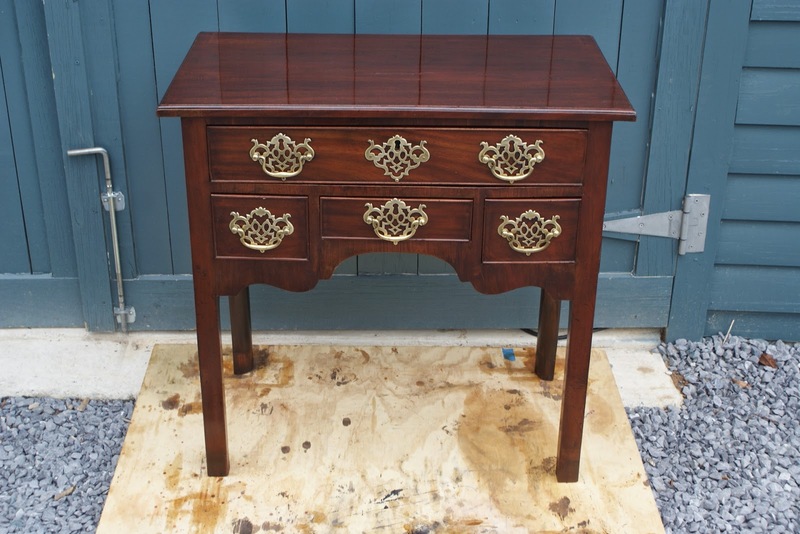 Besides the straight legs on this particular dressing table, the shaped aprons on the sides and the hardware used are consistent with the later half of the 18th century. One other important component is the use of mahogany as a primary wood. Mahogany came into widespread use in England after the 1720's and by the 1750's had completely replaced English walnut as the primary wood used in furniture construction. 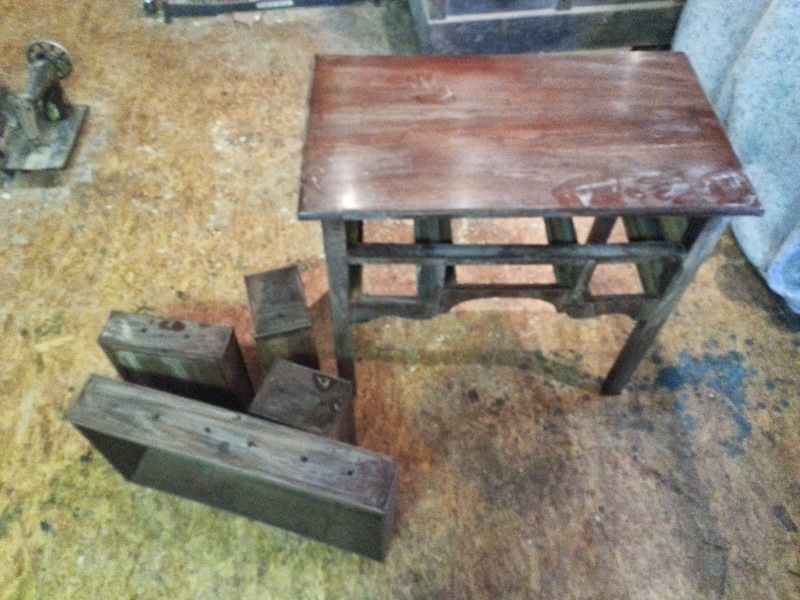 The use of this wood, coupled with the design characteristics mentioned above, help me to determine the age of the table. One other important element to consider when dating English furniture is the orientation of the drawer bottoms. Prior to 1750, the drawer bottoms were oriented so that the grain ran from front to back. 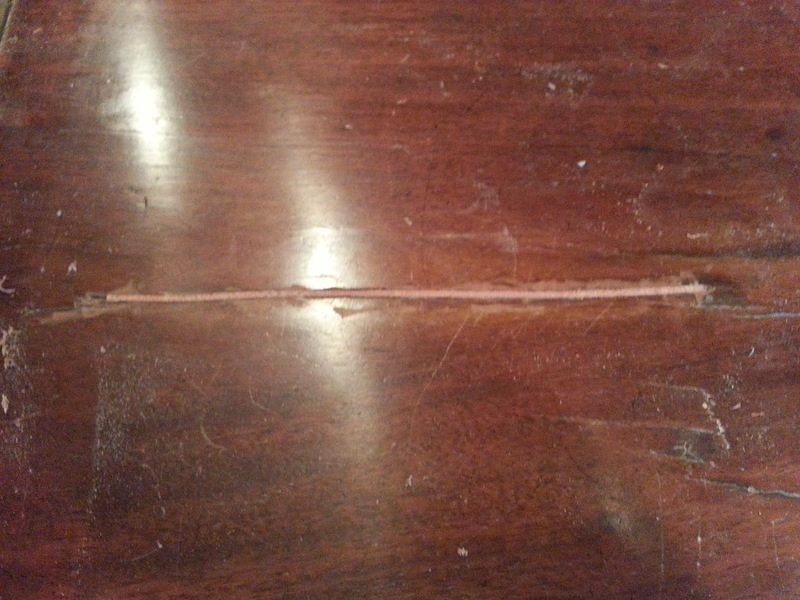 The bottoms were nailed to the bottom of the drawer sides and with no allowance for expansion and contraction, the bottoms would typically crack in various places. 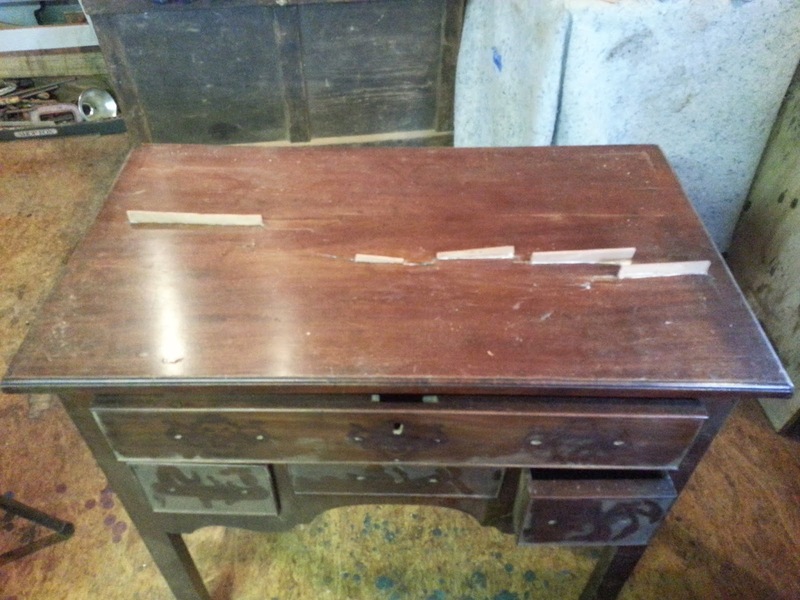 In the photo below, you can see the orientation of the drawer and the subsequent cracking which was later repaired. Around 1750, English cabinetmakers began to run the drawer bottoms with the grain running side to side, nailing the bottoms only on the backside of the drawers. This allowed the board to move with the seasons and (hopefully) not crack. 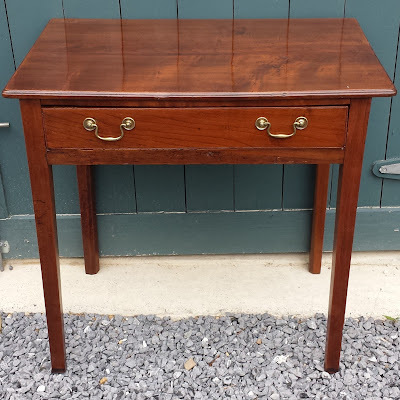 While this is a difficult way to determine age, the drawer construction of the dressing table shows the bottom boards running front to back, which might point towards a date closer to 1750. When the dressing table came into my shop, The first thing I did was to look it over and figure out all of the repairs that needed to be done. 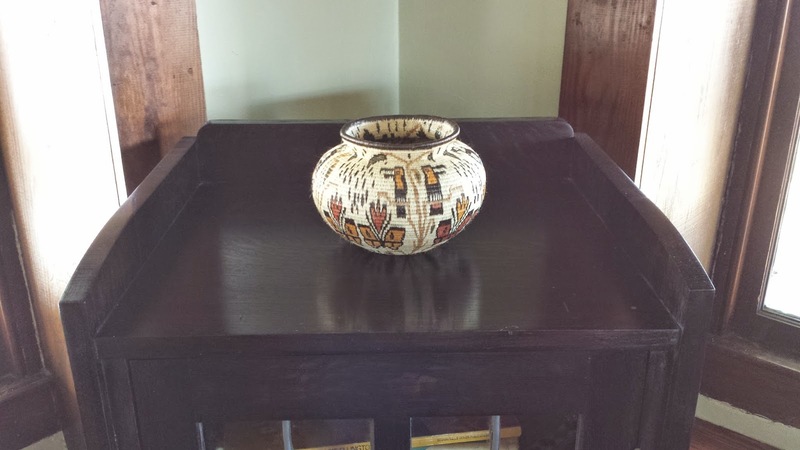 The finish on the piece appeared to be original, or at least very old, and in good shape. The top and drawer dividers were veneered with mahogany over a pine secondary surface. 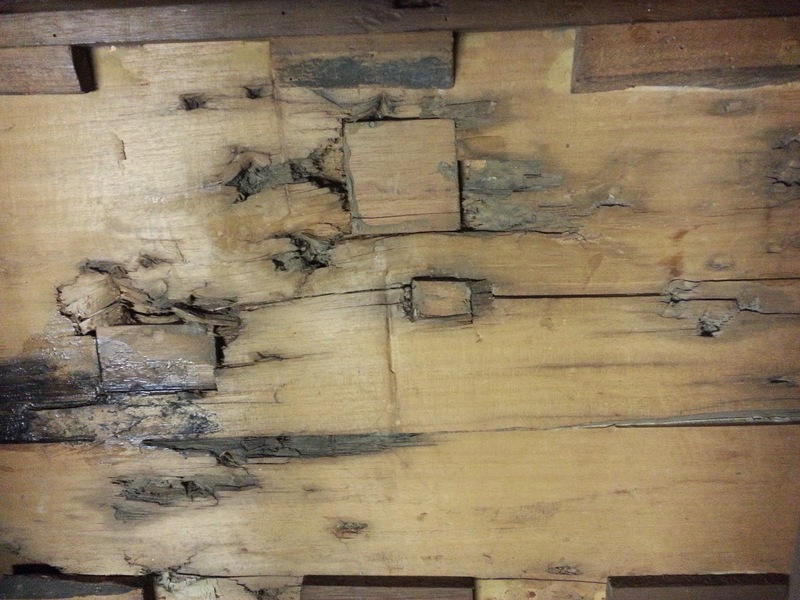 Differing rates of expansion and contraction in the veneer and substrate, due to changes in humidity, caused the veneer to separate from the pine, and in the top, for the pine and the veneer to shrink together causing cracks in the surface. 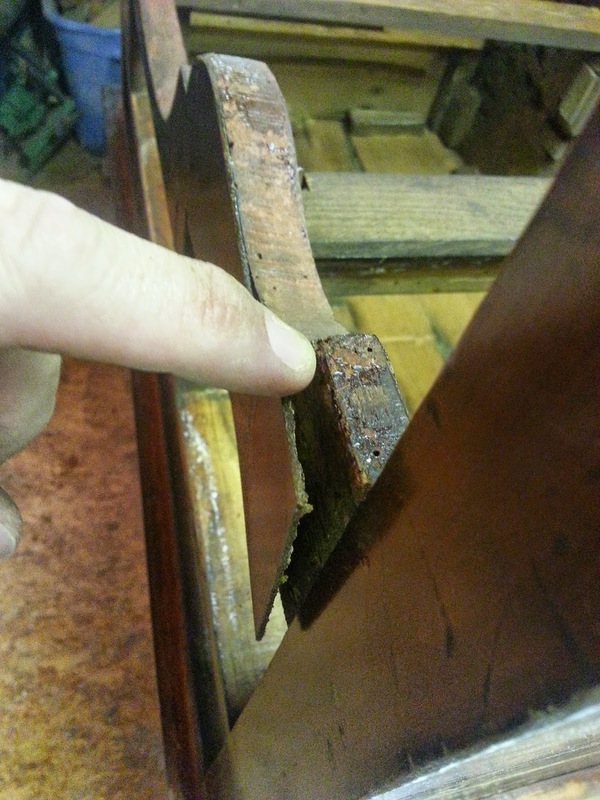 On the dividers, some of the loose veneer had fallen off and was lost, mostly around the bottom of the apron. One other bit of damage on the top can be seen in the photo below as a line running parallel to the edge about 3/4 of an inch in. 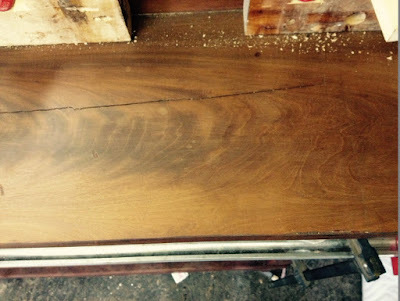 This is known as telegraphing and is caused by the woods that make up the secondary surfaces shrinking at different rates, causing the "shadow" of the joinery to be seen through the veneer. 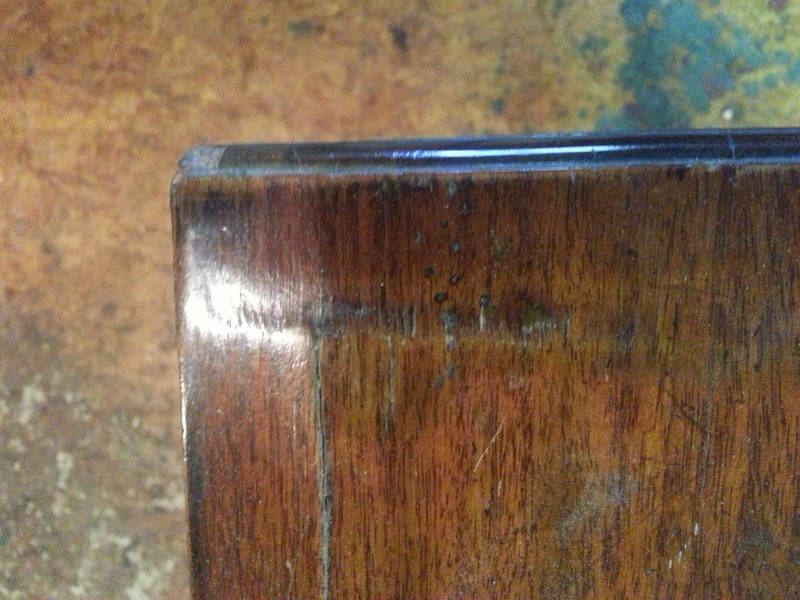 This is a common characteristic of antique veneered pieces and shows the age of the piece, so I do not try to repair this, but look at it as an attribute. While looking at the damage and coming up with a plan of attack on the repairs, I also keep an eye on the originality of the piece. Part of this is to help me determine if something needs to be replaced and also just out of curiosity and to get a better understanding of the piece when discussing it with the owner. One of the big questions with this piece was whether the hardware was original or not. Coming up with a definitive answer to this question can be difficult, but several clues led me to believe that the hardware was quite old and in most likelihood, original. 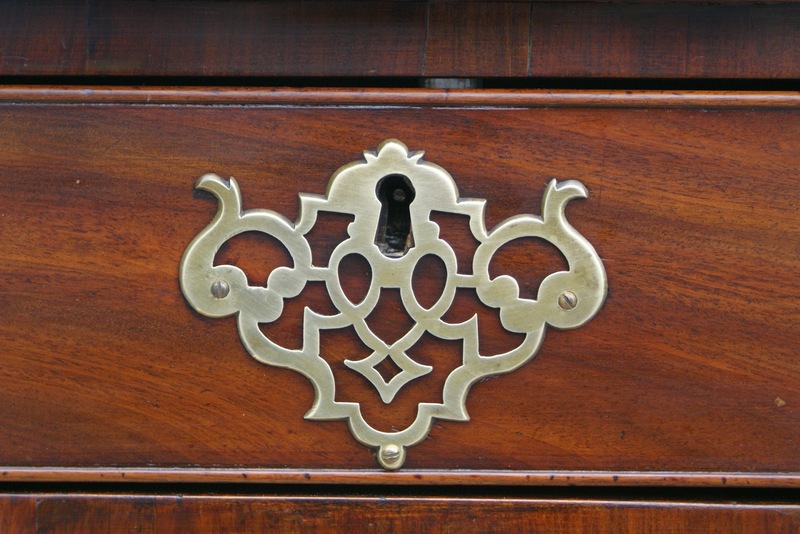 The pulls and escutcheon plates were pierced and in a style that was consistent of the second half of the 18th century. 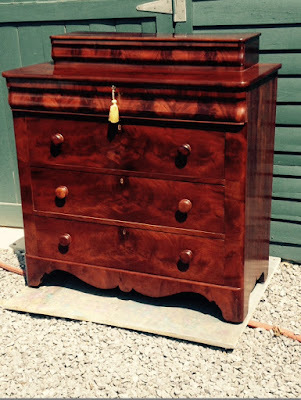 The top drawer is seen with two pulls and one escutcheon plate below. 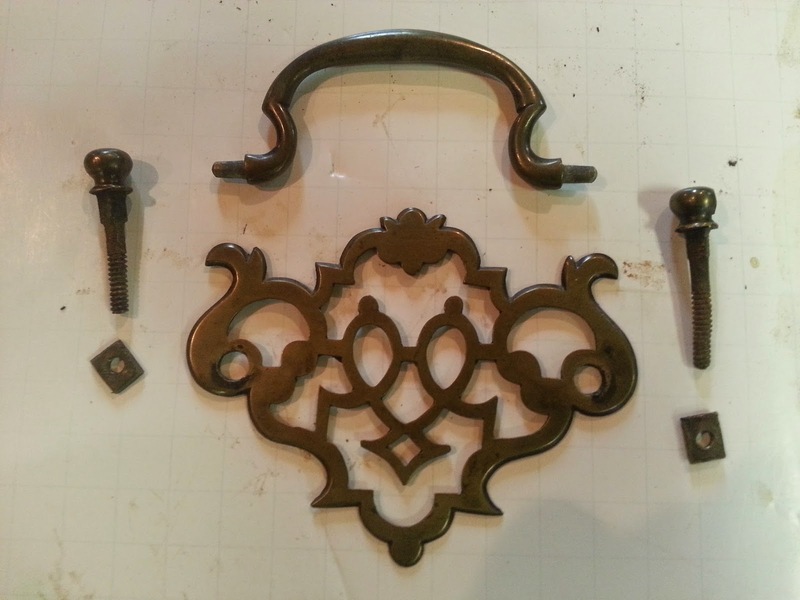 When the hardware was removed, all of the individual components were also consistent with 18th century manufacture. The back plate was separate from the posts, the posts had hand cut threads cut into the post stock (no machine screw threaded in from the backside) and the nuts were square and irregular, suggesting they were made by hand. 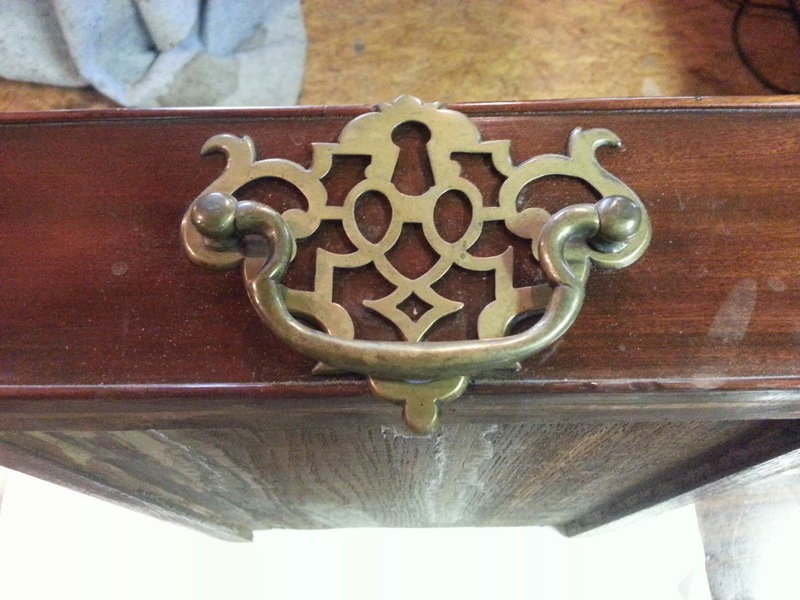 One other detail was that the back plates were beveled with a file on the back side on all of the pierced edges, casting a shadow when the back plate was against the drawer front. This gave the back plate visual depth and is something I have never seen on modern replacement hardware. 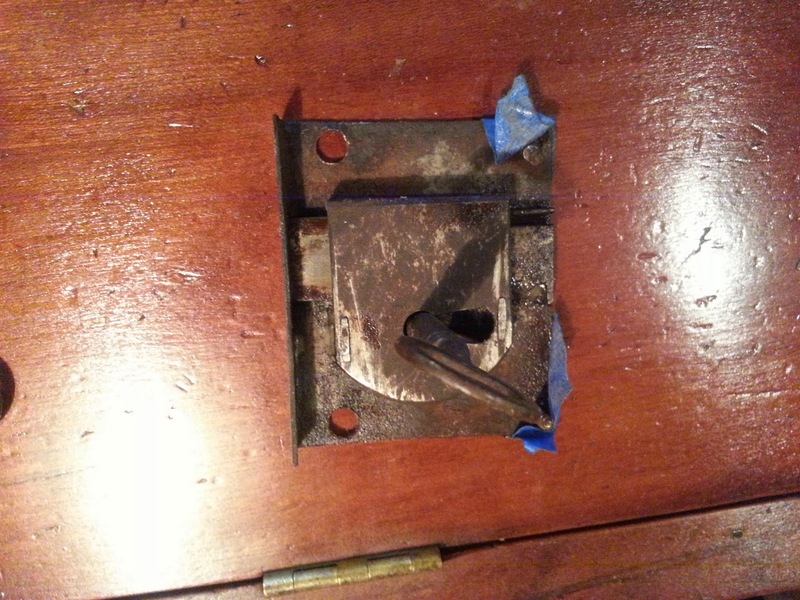 On the drawer itself, a "shadow" is left where the back plate had been. 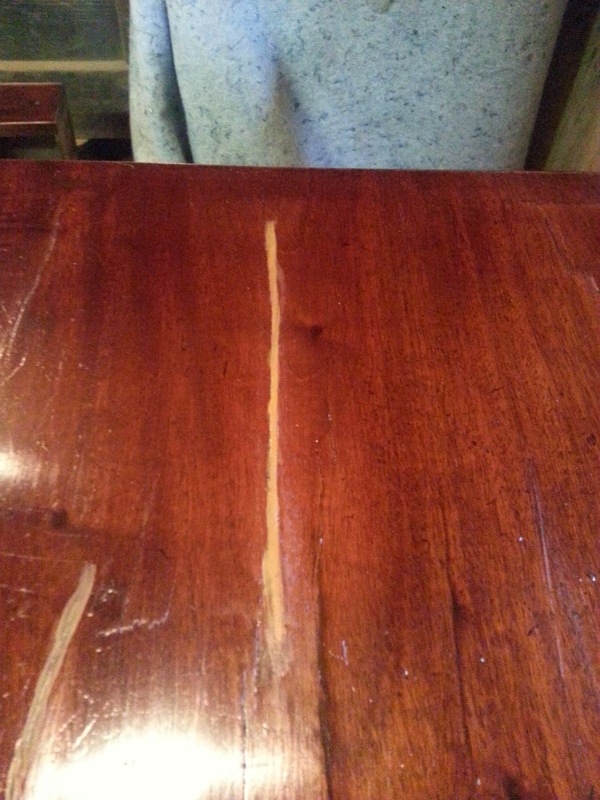 This is caused by the wood on the drawer surface being exposed to sunlight, while the wood behind the back plate is not. Usually when other hardware was present, evidence of other shadows can be seen where that hardware had been. In this case, it appears that the current hardware was the only hardware on this piece. One the inside of the drawer, the presence of numerous holes for different hardware boring would suggest that the piece once had different hardware. 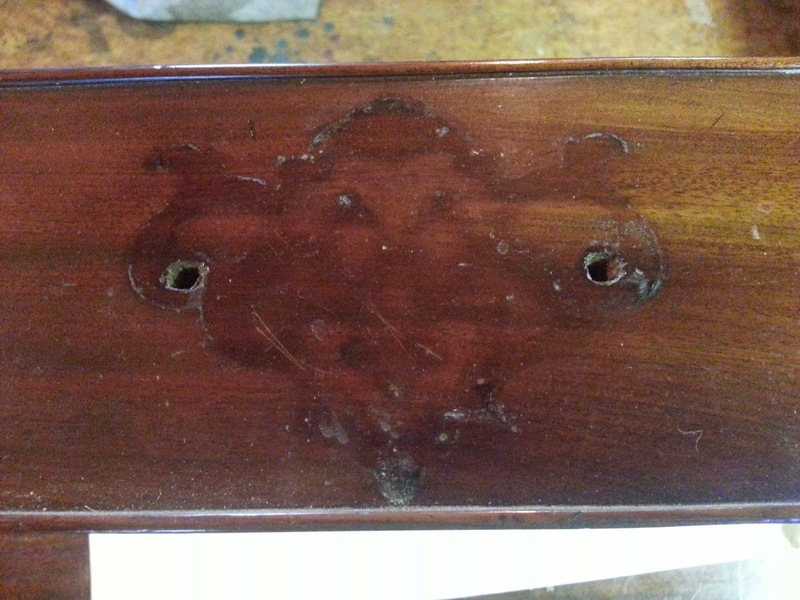 On the dressing table,only two holes were present for each pull. One peculiarity with the lower center drawer front was that the hardware was too large for the drawer, so that the bottom edge of the hardware overlapped the cockbeading on the drawer front. One might be inclined to think that this would indicate that the hardware was replaced, but in looking at the piece as a whole, I found other evidence of "using what you have". 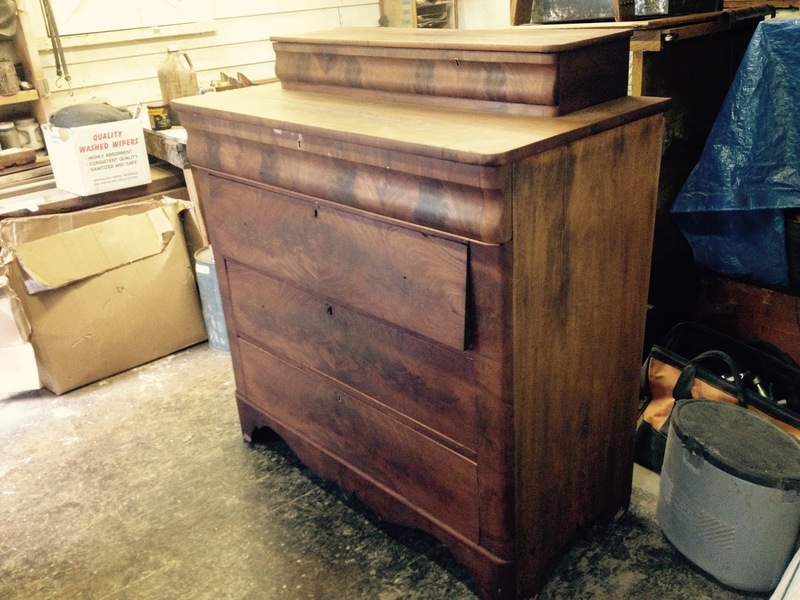 The interior side of the top was an extremely distressed piece of wood that looked as though it had been re-purposed, or more likely, saved from the scrap pile and patched in order to make it work as a substrate. Wood was precious in the 18th century, as was the time it took to mill that lumber to usable stock. 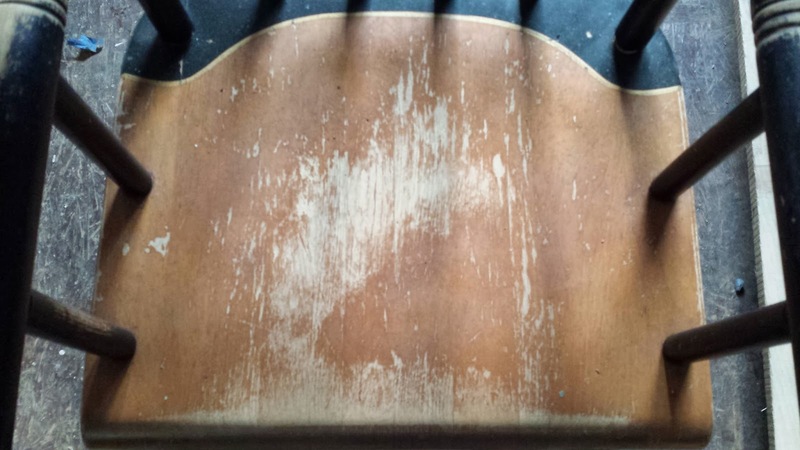 If a board that would never be seen had some defects in it, sometimes it was easier and more cost effective to use that board instead of finding and preparing a "clean" board. Perhaps the same was true of the hardware. 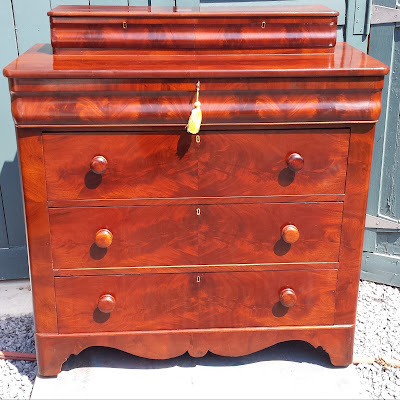 The cabinetmaker may have simply had that hardware on hand and decided to use it even though it overlapped one of the drawer fronts. When the piece is viewed as a whole, it certainly does not detract visually, and in my mind, details like this add speculative interest to the piece and it's history. 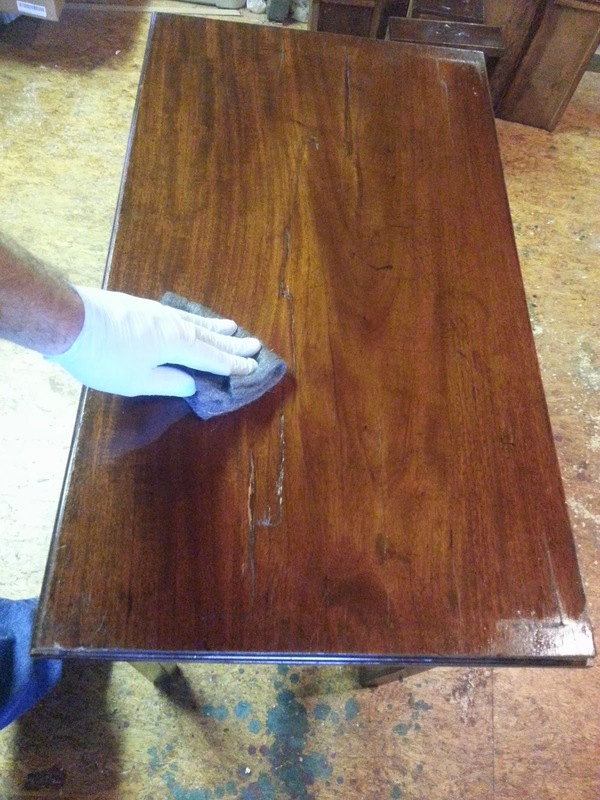 Getting down to business, the first step in restoring a piece is to clean the existing finish using low odor mineral spirits. The mineral spirits are applied the finish with #000 steel wool and worked in the direction of the grain. 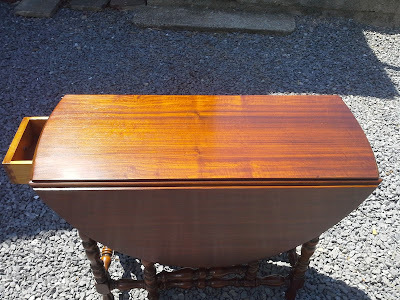 The purpose of this is to remove the old wax and oils from the finish and clean the finish so there will be no bonding issues with any new finish that is applied. After the mineral spirits are applied , I allow it to dry on the piece, creating a white hazy powder over the entire finish. Once this is completely dried, I remove the residue with a clean piece of steel wool. The veneer on the front of the case had loosened in many places and needed to be glued in place. 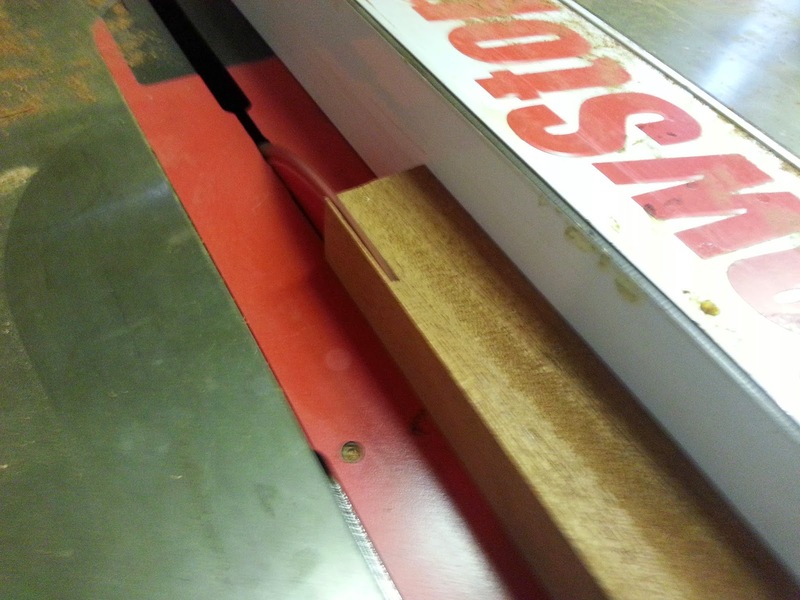 A good way of finding the loose areas is to go methodically over the entire surface and tap the veneer. There will be an audible difference in the tap where the veneer is loose. I put a piece of the tape on that spot to help me remember the loose areas. Before gluing the veneer back in place I use the back side of a no.11 X-acto blade to scrape away the old glue. 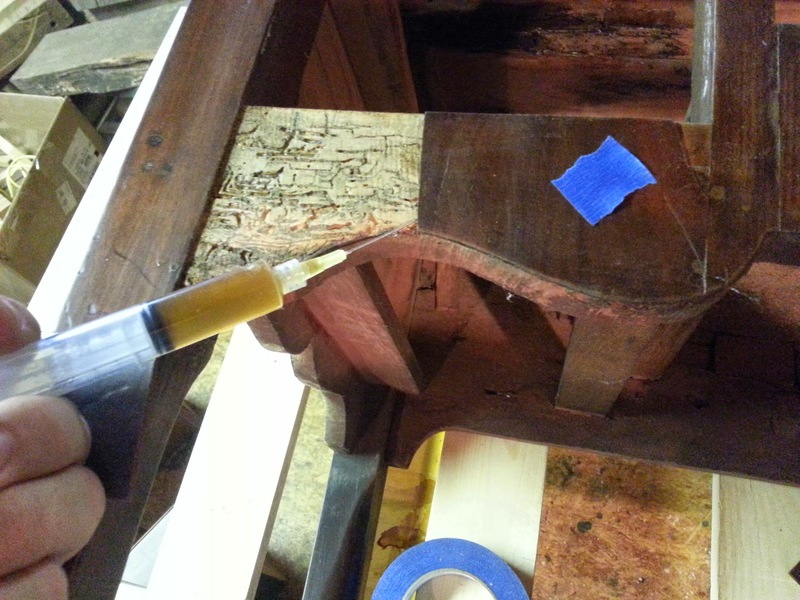 Where the veneer is loose, but not loose enough to get a tool under, I use a syringe to inject hide glue into the gap. I have several broken pieces of furniture that I keep on hand that are missing essential parts or are other wise not worth restoring. I use them to cut veneers so that I can match the color and finish wear as best as possible. 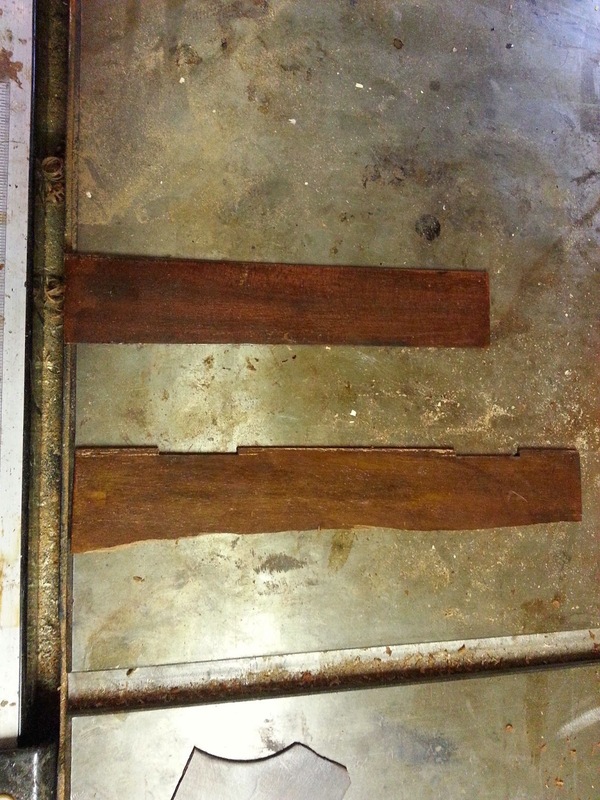 Below are two two sections of re-purposed veneer I cut on the table saw from solid stock and used to patch the veneer that was missing on the case. 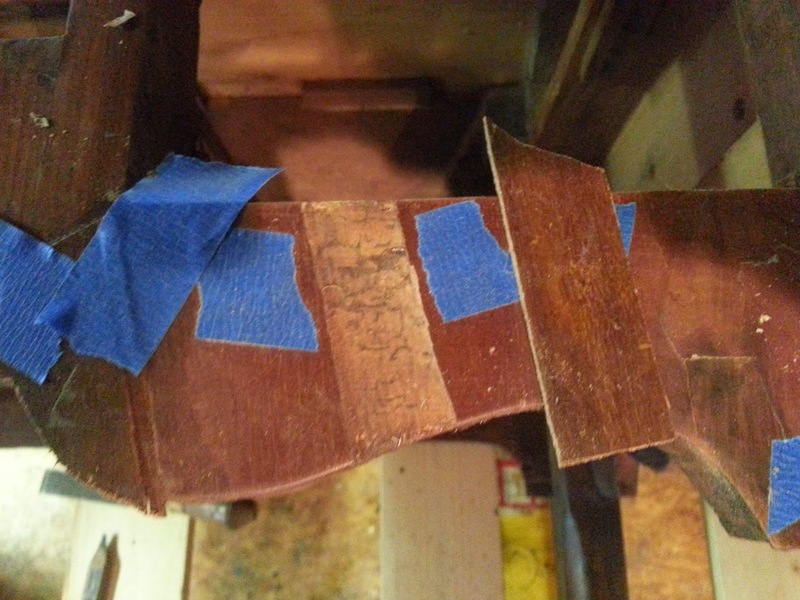 Below to the right of the missing section is a patch left oversized that I used to patch the veneer. The patch is laid over top of the area to be patched and the veneer on the case is scored along the edges of the patch. 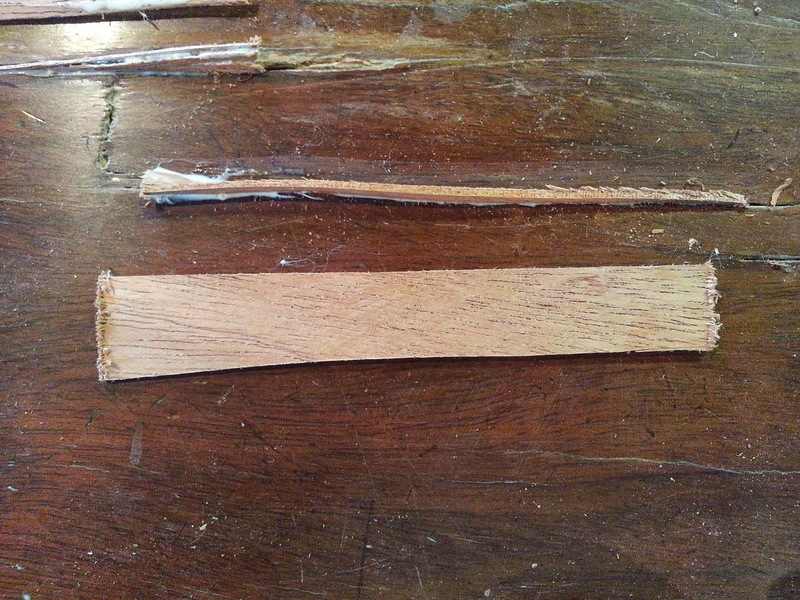 In essence, the original veneer is cut to fit the patch, instead of the patch being cut to fit the original veneer. To level the patch I used a razor blade as a scraper to slowly remove material from the back side so that the patch sat level with the surface. The leveled patch was then glued in place using hide glue. It was clamped in place overnight to let the glue set. After the patch was glued in place, I cut the excess wood from the top and bottom of the apron. Because the hide glue can take a long time to set, I try to glue as much as possible in a single session. 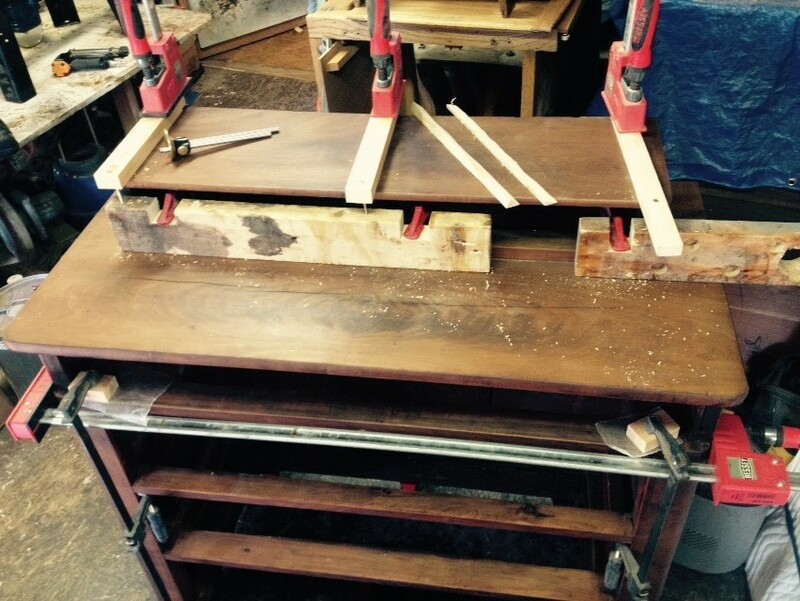 The photo below shows clamps holding down loose veneer while the glue dries. Taking a large detour from the concept of conservation, the owner of the piece asked me to extend the height of the piece by two inches. While this is not something I typically do, I felt inclined to follow the owners wishes, so I devised a way to heighten the piece while altering it as little as possible. 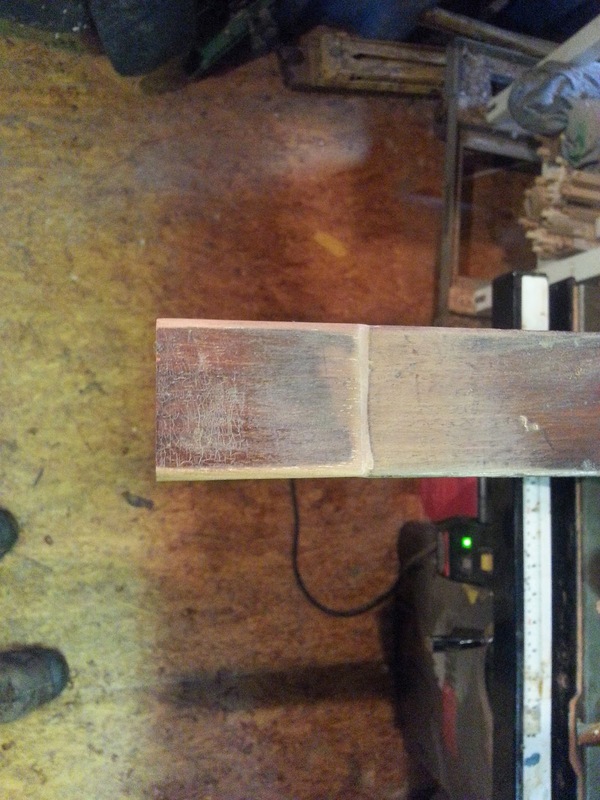 I started with a quarter inch thick piece of reclaimed mahogany with a nice old finish. 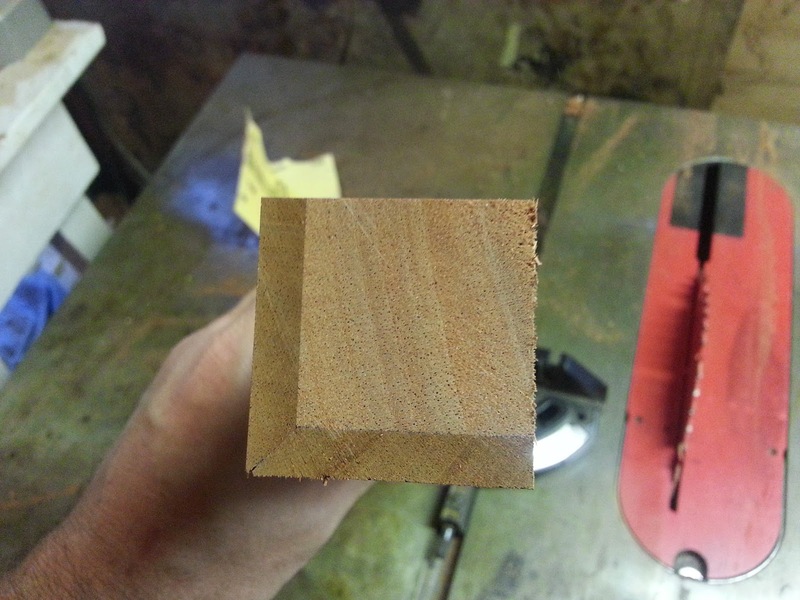 I cut two boards from this with one edge on each board beveled at 45 degrees. This allowed for a mitered corner. 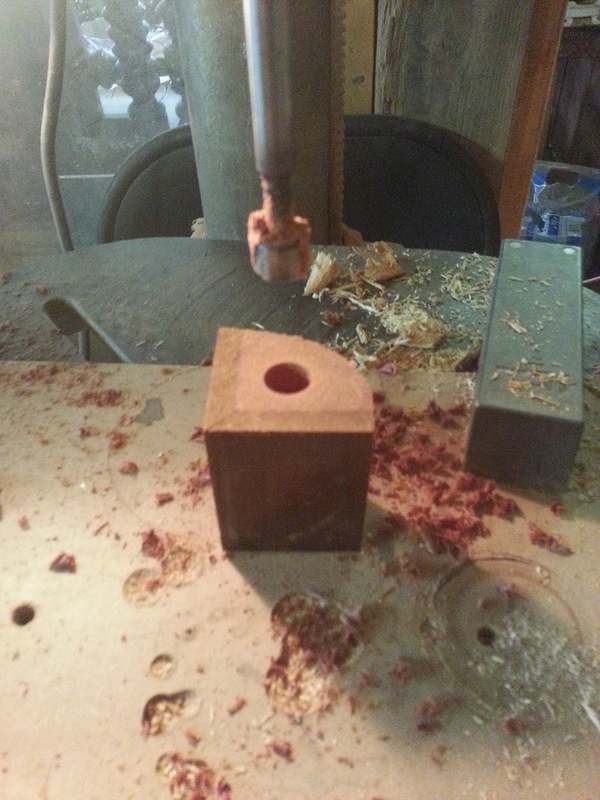 I then glued the two pieces to a core of new mahogany. 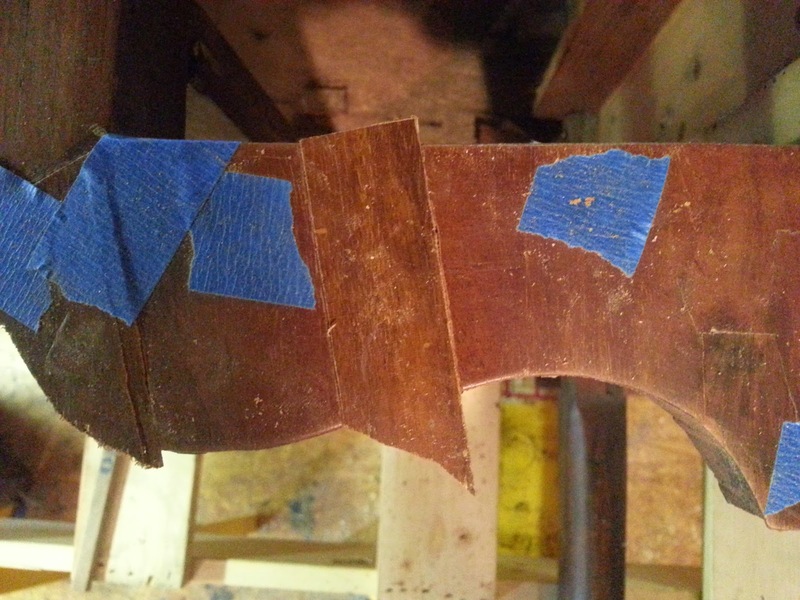 These two edges would become the two flat outer faces of the foot. The inside corners of the feet needed to be either rounded or beveled, so I did not attach old wood to the two inner faces. 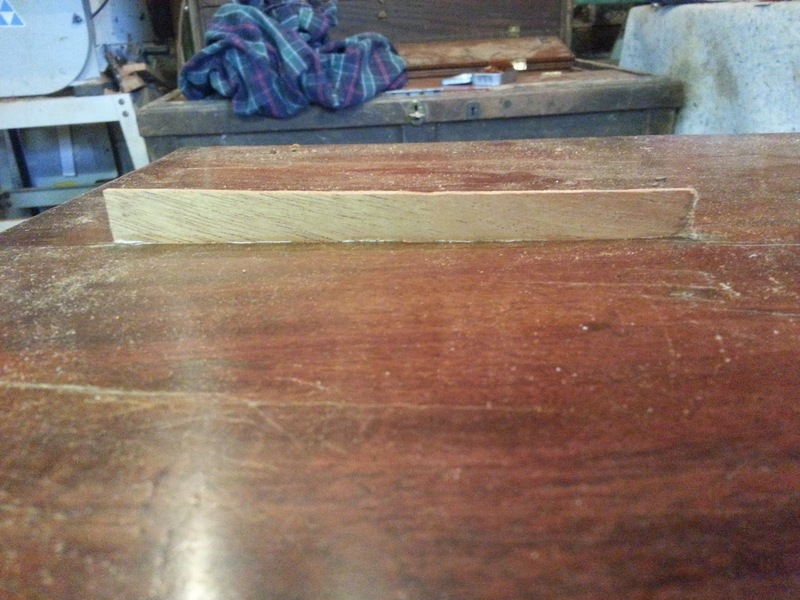 After the glue had set I cut four two inch sections and rounded the edges on two and beveled the other two. The interior profiles of the legs of the front were beveled and the back two had the rounded edges. To minimize the damage to the original legs I glued the feet on with no joinery. 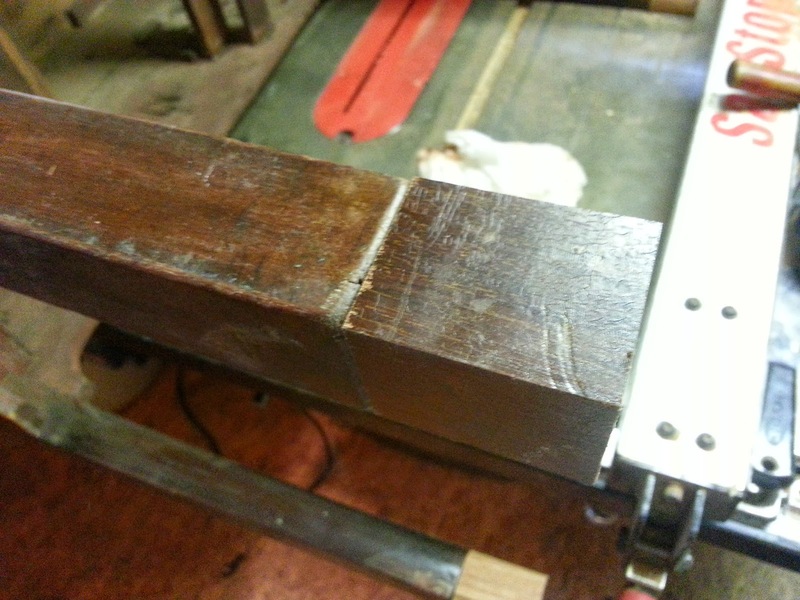 Instead of joinery I recessed a screw which extended from the new foot into the old.. 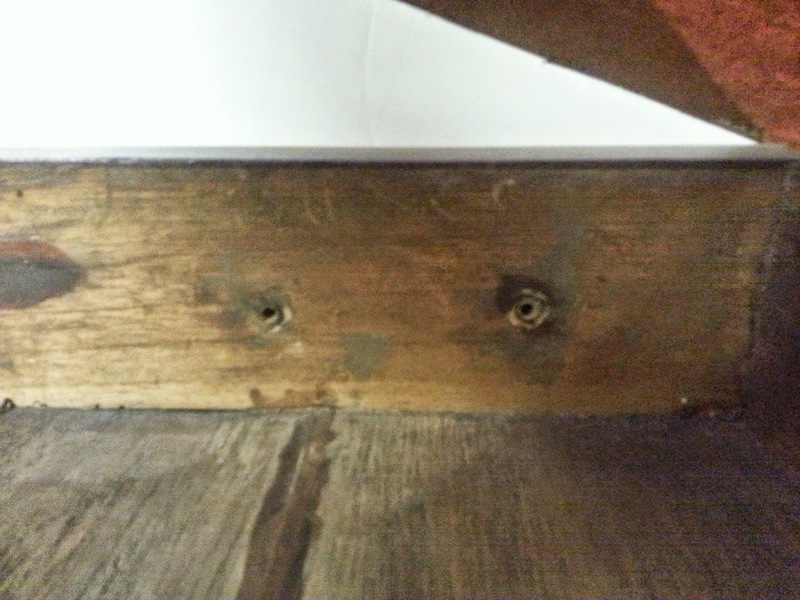 This created a much smaller hole than a tenon of wood and if some future restorer wanted to reverse the damage, it would mean removing the screw and knocking the new feet off. 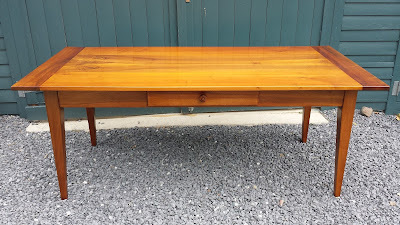 The finished wood was sanded a little bit and the inner faces were stained to match the color of the legs. 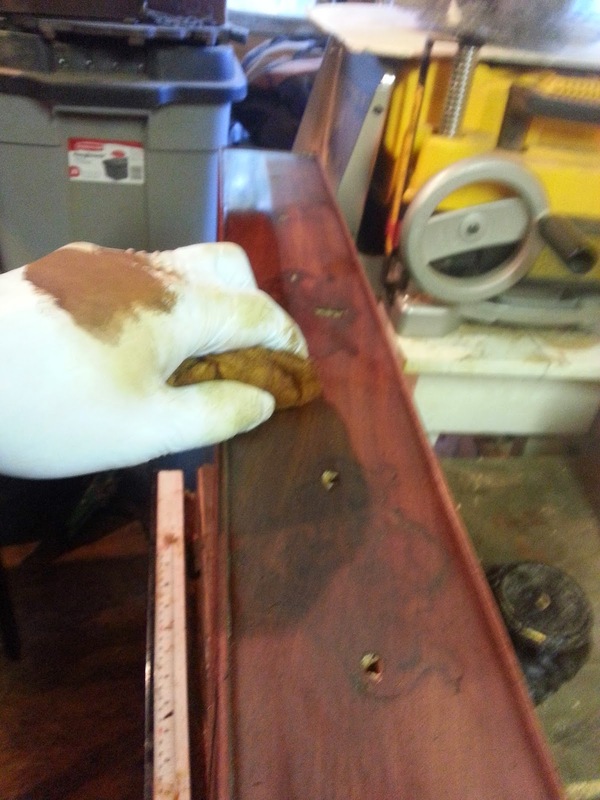 Wood putty and wax filled any gaps. As mentioned above, the top had many cracks in it that were caused by shrinkage. The cracks can be seen below. 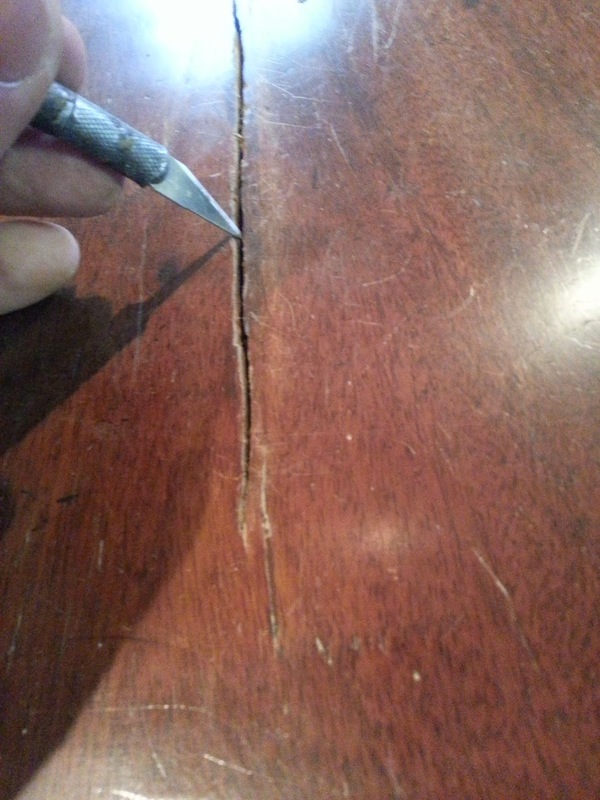 The first step in repairing these cracks was to clean any dirt or old glue out. This was done with the back side of the no.11 x-acto used as a scraper. 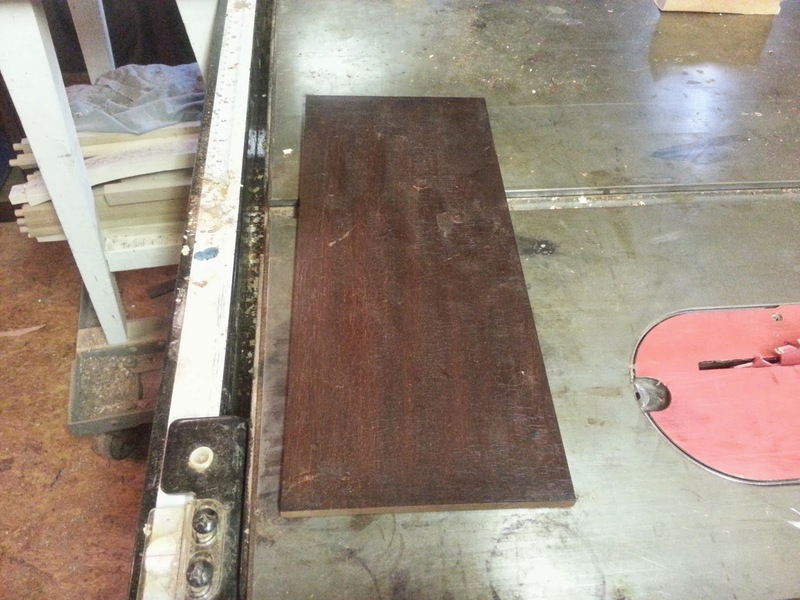 I cut long wedges from mahogany stock with the blade of the table saw set at 5 degrees. I generally keep the angle of the taper at 5 degrees for these wedges but adjust the width of the wedge as needed to fill the crack. After the wedges were ripped I cross cut them to fit the length of the cracks. 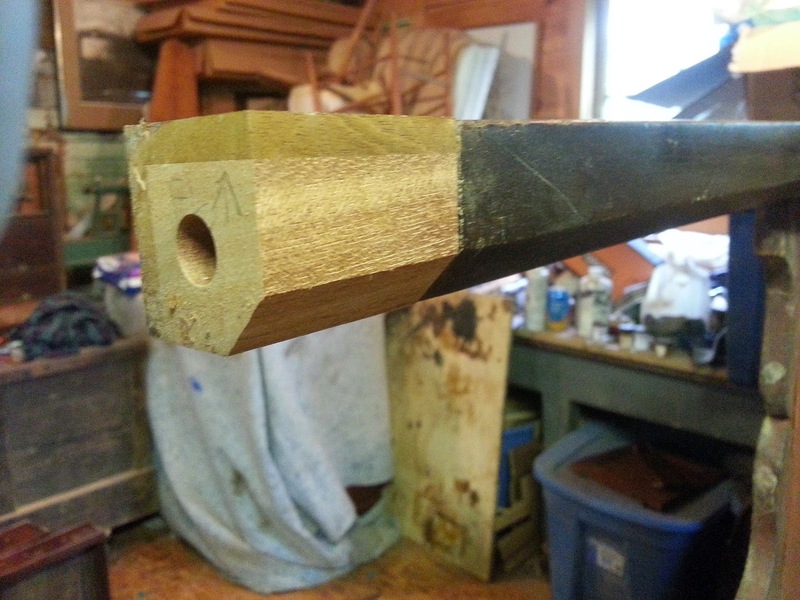 I then tapped the wedges in place with a mallet. As the crack widened, the wedge would seat lower in the crack. 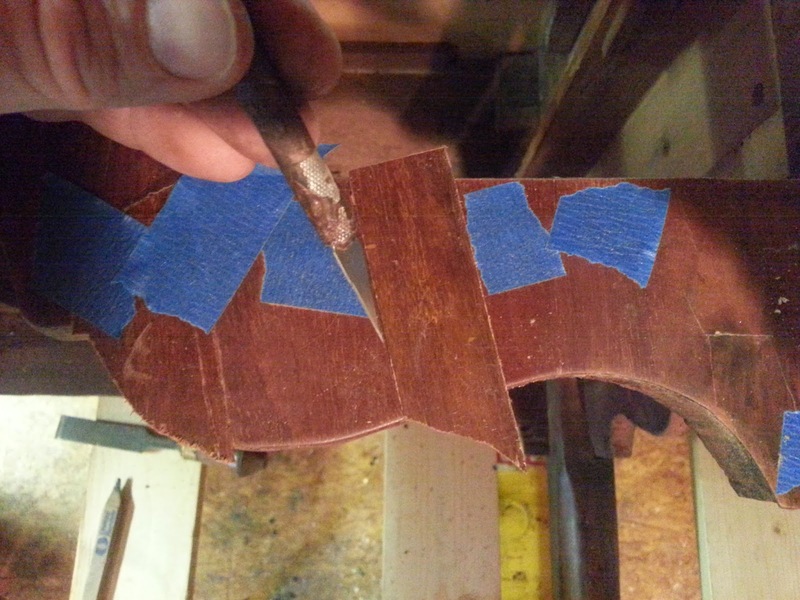 The wedges were glued in place and the glue was allowed to set. 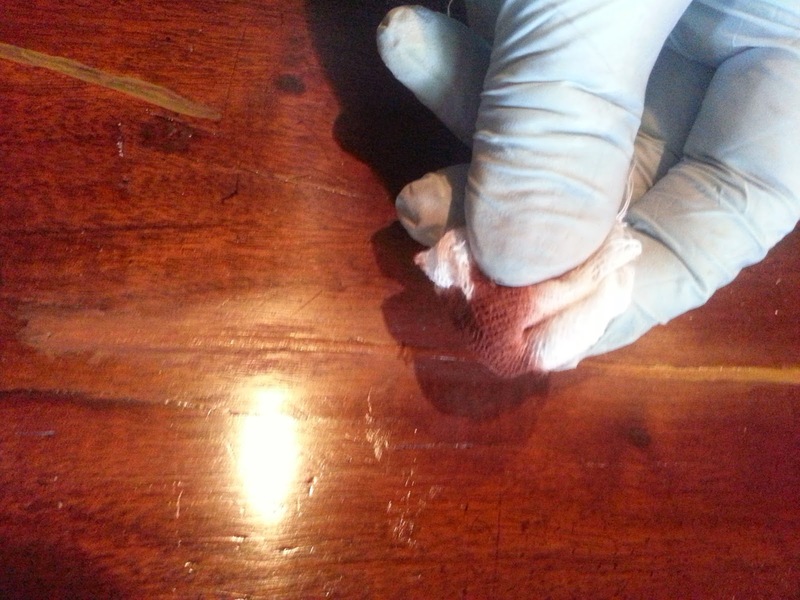 Once the glue had set, I scored a bit above the surface to remove most of the waste material. 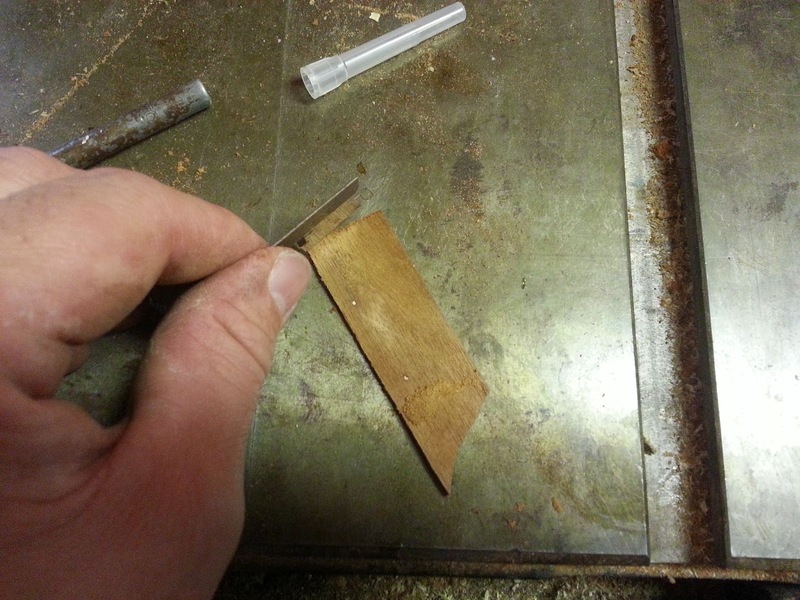 Before discarding the waste, I laid it alongside the wedge to help me remember which direction the grain was going. When you have multiple wedges to level, this can be helpful. 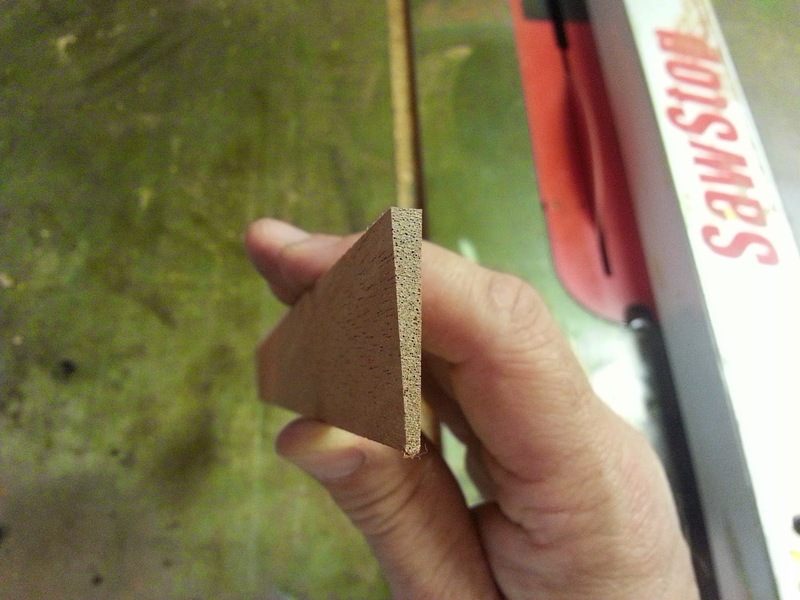 The next step was to level the wedge with the surface. This was done with a chisel and ultimately a little fine sand paper. This photo shows all of the wedges leveled and ready to be touched up. When I am ready to touch up. 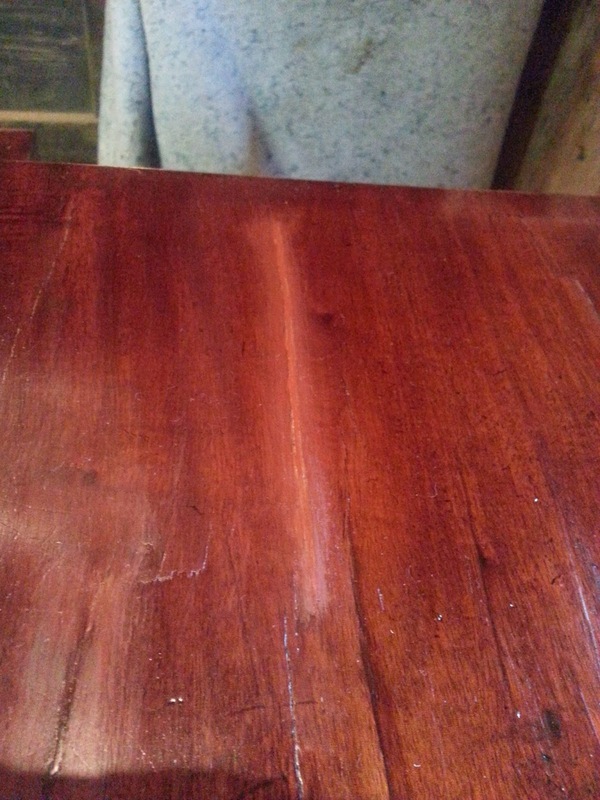 I first apply a coat of finish to the area to be touched up so I can get a sense of color and sheen. I use dewaxed shellac to seal the old finish because it chemically bonds to the original alcohol based finish and has less adhesion problems then an amber shellac containing its natural waxes. I then apply powder stains with lacover padding finish as a solvent to the touch up the patch. The first step in this case was to apply a yellow back ground color. I then applied a red that closely matched the mahogany lightly over top, allowing the yellow to come through a bit in places. 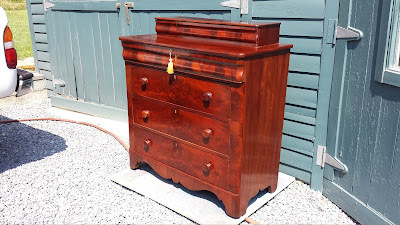 Gradually, the red stain was applied until the patch started to disappear..
To fine tune the touch up, red mahogany liquid stain was also used on the touched up area. I find that this really helps to give depth to the touch up and blends it to the rest of the surface. 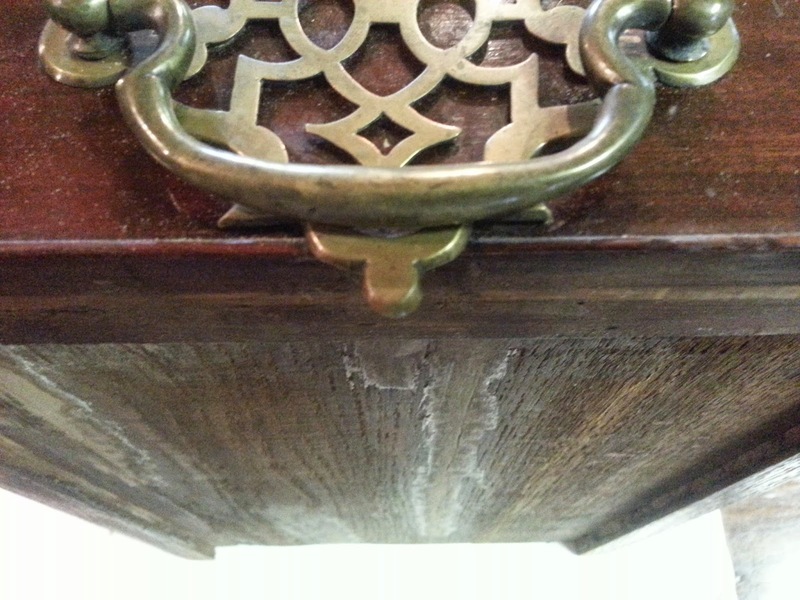 Off all of the tools a restorer uses, I have found touch up to be the most challenging! 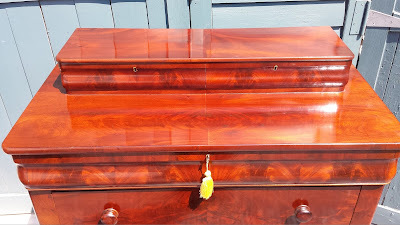 As mentioned earlier, I use both dewaxed and waxed shellacs for different purposes. 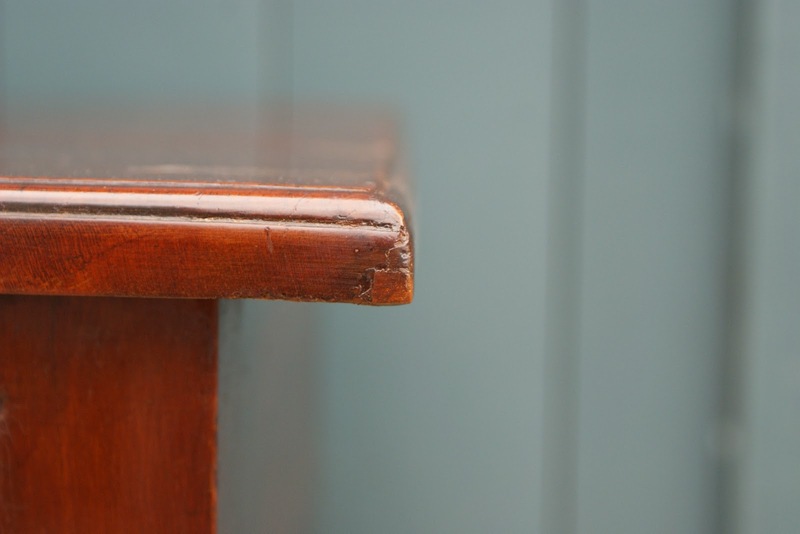 I have found that shellacs containing wax can have issues with old finishes causing the old finish to crackle a bit. This is not the end of the world, and there are different ways of dealing with this, but if it can be avoided, it is better. 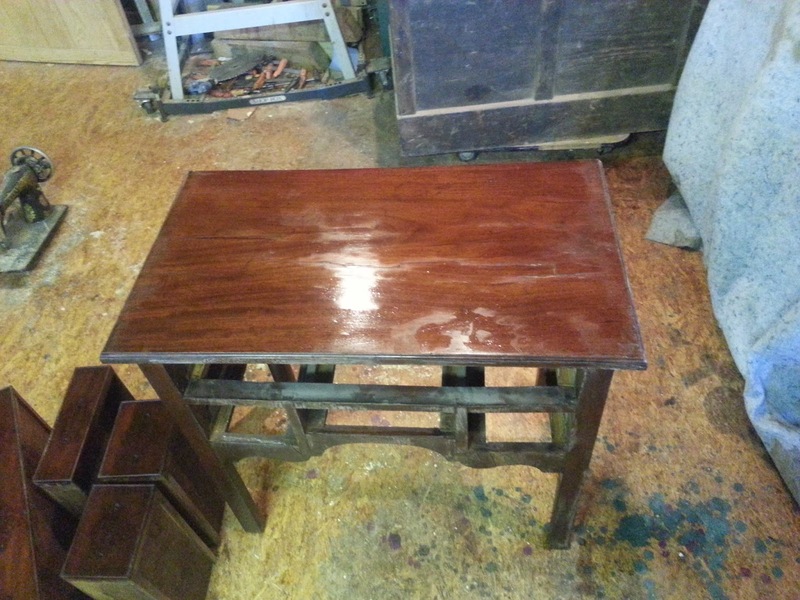 One way I do this is to apply dewaxed shellac as a sealer coat over the old finish. I may do this a few times. I then switch back and forth between amber waxed and dewaxed shellacs. The shellac containing wax is easier to buff and lays on a bit smoother and thinner. 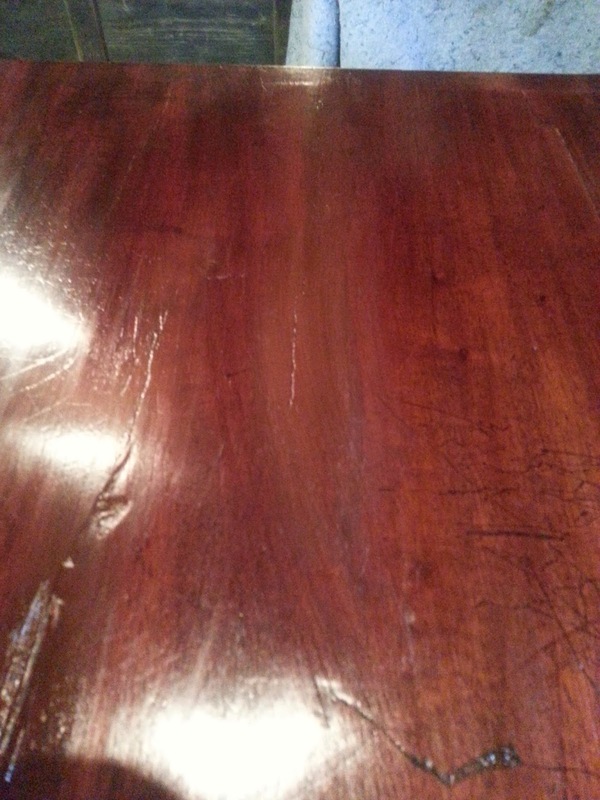 Dewaxed shellac builds up fast and creates a very shiny surface. By using the two together, I am able to control the sheen and get the desired results. 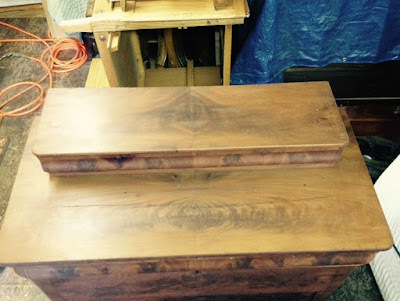 If a harder, more durable finish is desired, I tend to coat with dewaxed shellac, especially on top surfaces. Which ever finish is used, I apply it in thin coats with cheesecloth. 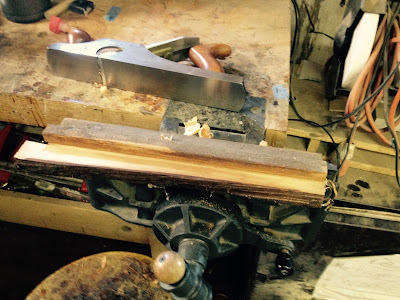 I always apply with the grain and work from the inside of a surface out to the edges. Between coats I abrade the finish with steel wool. The #000 steel wool dulls the finish quickly but can leave visual scratches in the coat that is abraded. As The finish gets closer to completion, I switch over to #0000 steel wool to dull between coats. 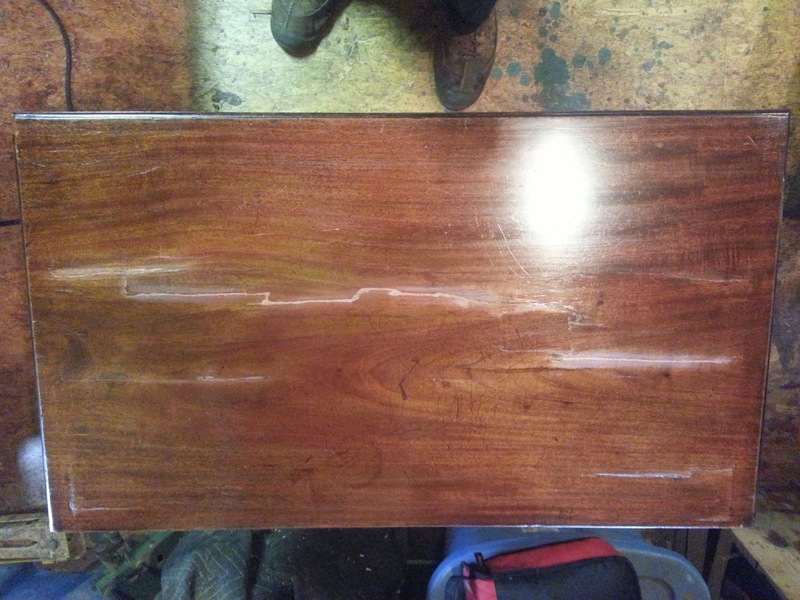 Below is a photo of the restored finish on the piece. 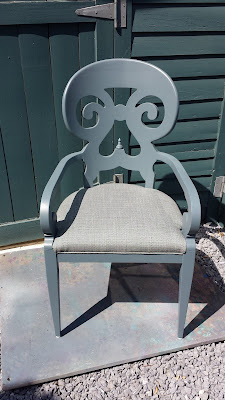 After the finish cures, I usually abrade the finish one last time with #0000 steel wool and then apply paste wax to the finish and buff it out with cheese cloth. While coating, I sometime apply a wash coat to the interior surfaces. 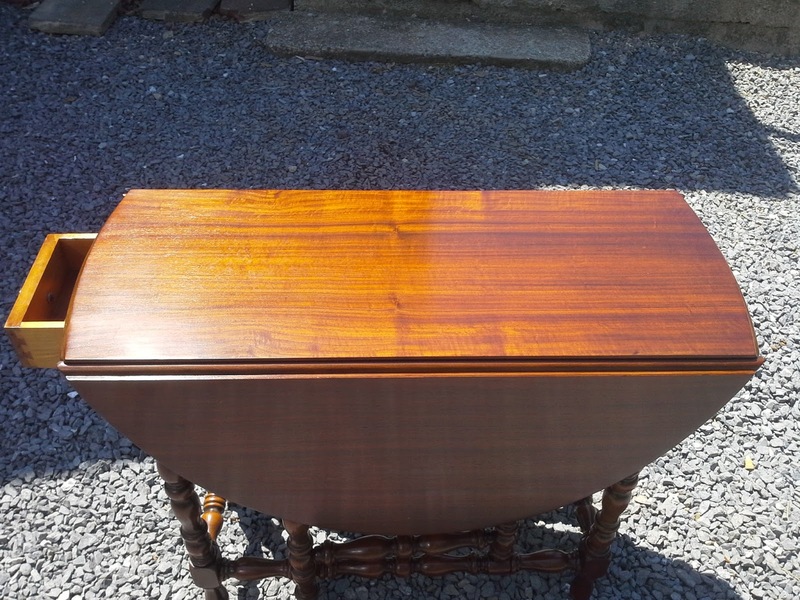 This is a coat of thinned amber shellac which gives the surface a clean appearance, but not a finished appearance. 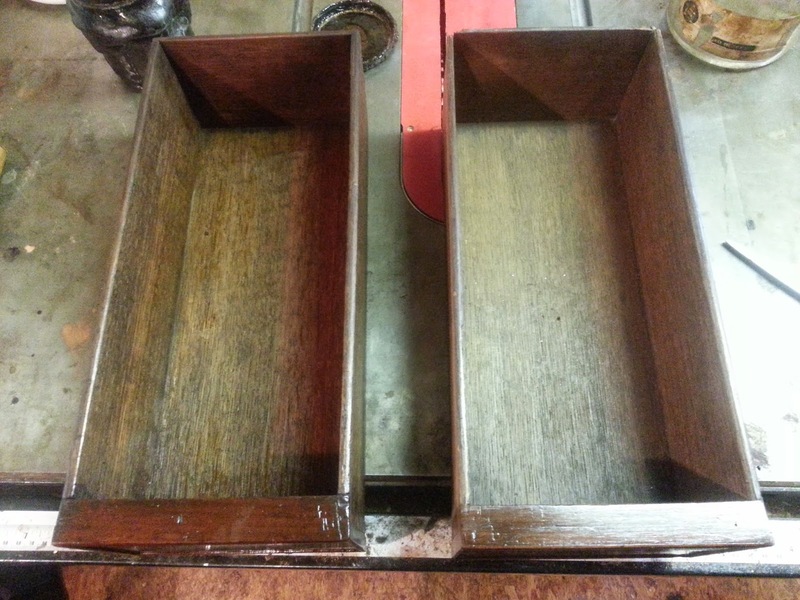 The drawer on the left in the photo below has had a wash coat applied while the one on the right has not. 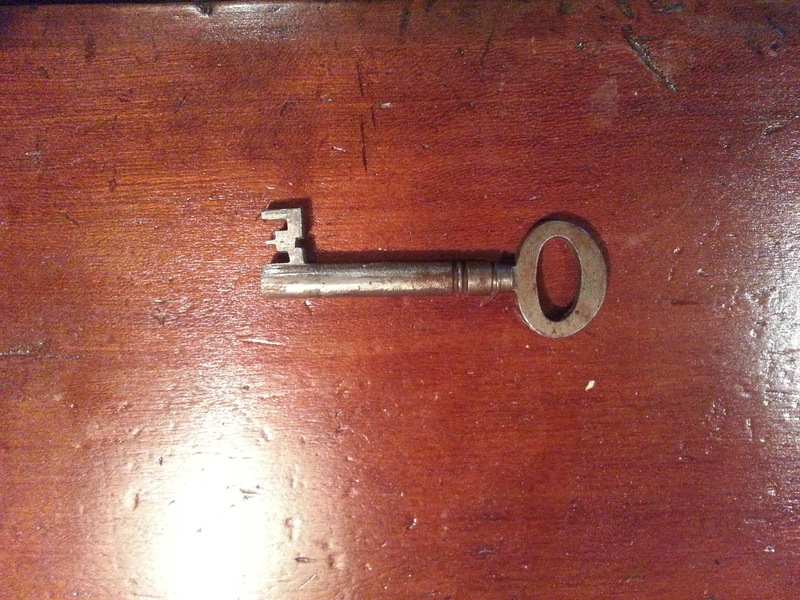 If a lock is present in the piece, I usually cut a key for it and clean and lubricate the lock mechanism. 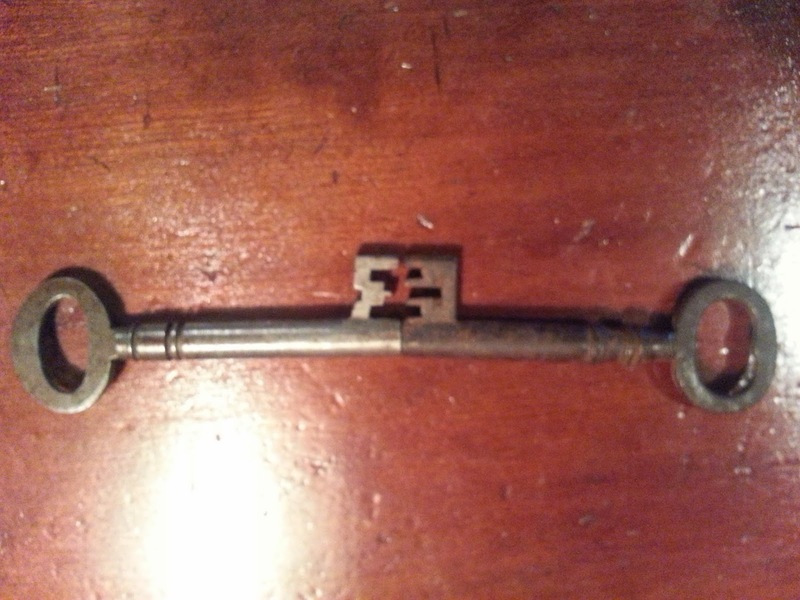 This piece had one locking drawer and a key that threw the bolt, but would not unlock it all of the way, leaving the bolt protruding from the selvage. This was because the bit on the key was not quite long enough. Unless a customer asks that the hardware be left "as is", I usually clean it a bit. 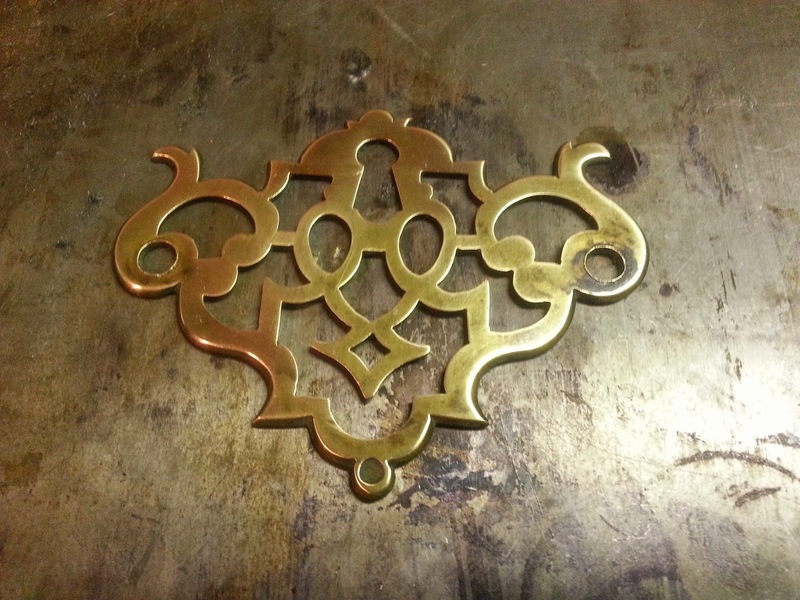 This brightens the look of the piece overall and any cleaning will later tarnish. 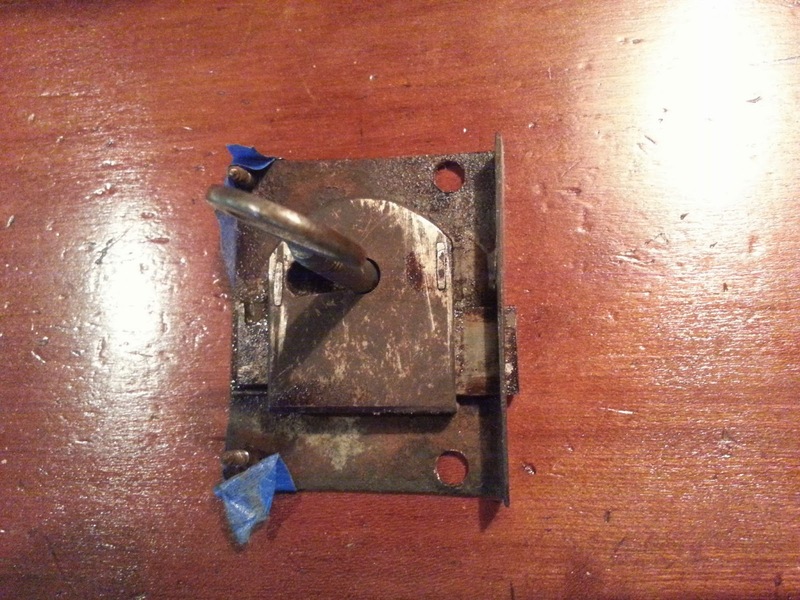 The back plate below was lightly cleaned using #0000 steel wool and elbow grease. 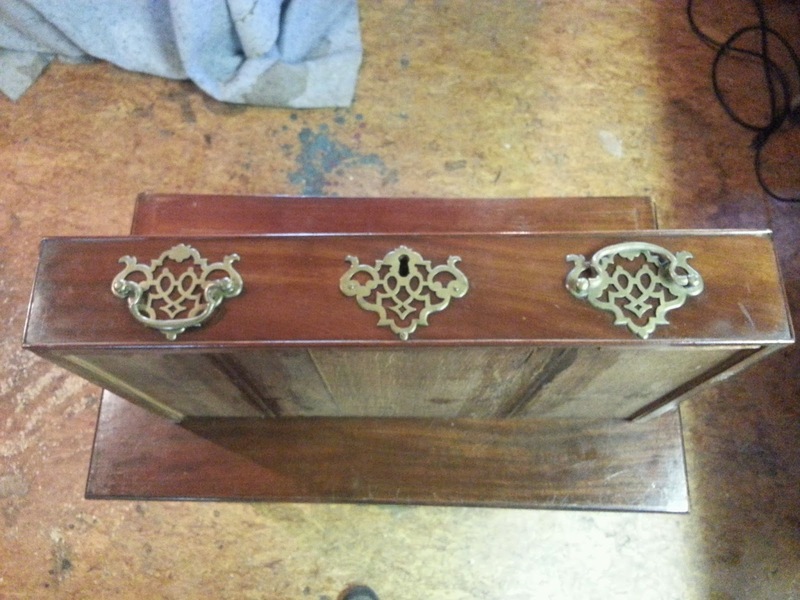 No finish was applied to the hardware so that it can be allowed to tarnish over time. Once the finish is waxed, I return the hardware to the piece and dust everything off. 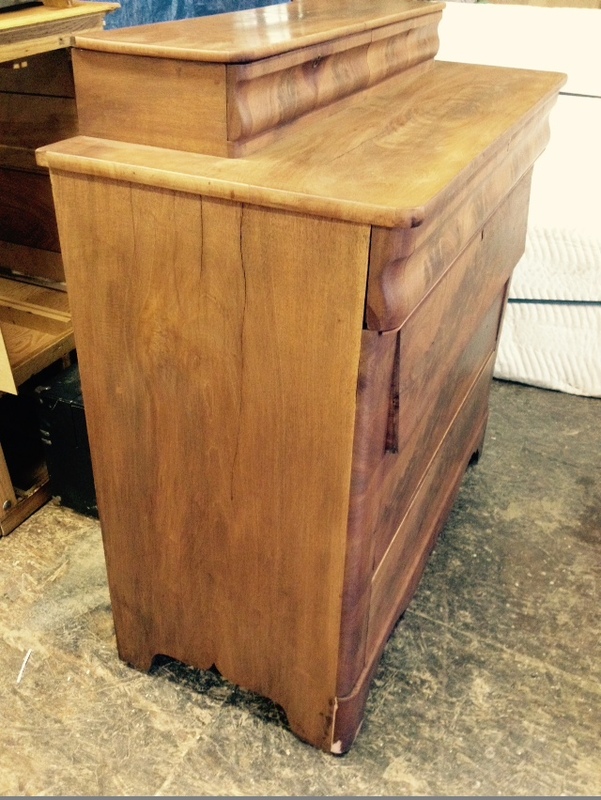 any last bits of touch up are done with a stain pen, and the drawer runners are waxed with paraffin wax. I usuually also provide a tassel with the new key to help it from being lost.